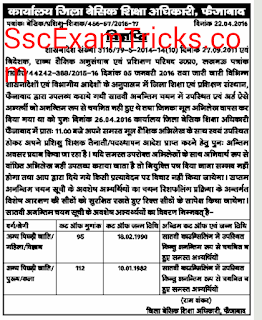 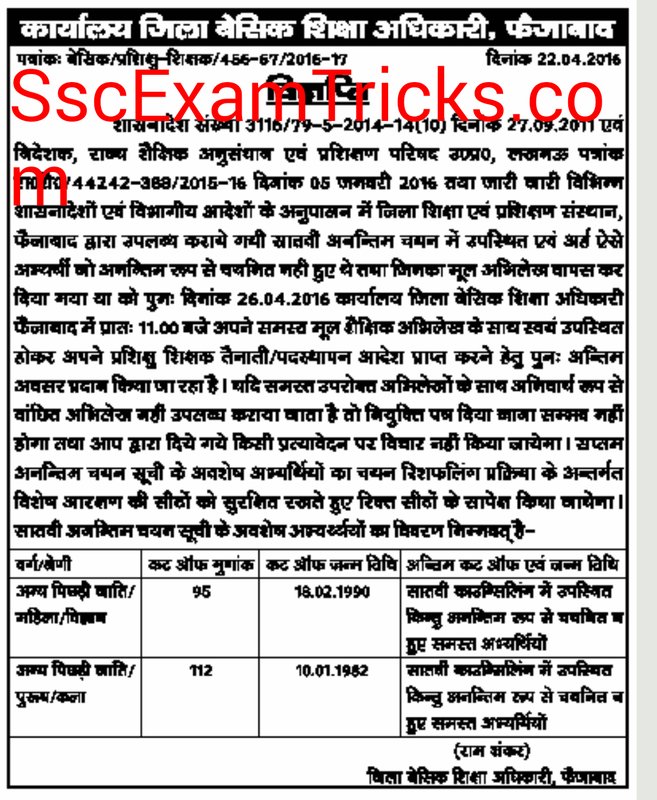 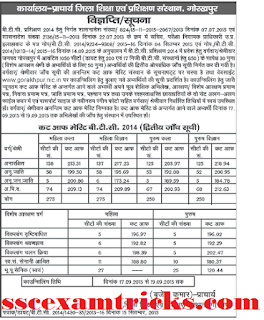 UP BTC 2016 2015 2014 Counseling Letter Released on upbasiceduboard.gov.in – Download BTC 2013 2014 2015 4th & 3rd Round Merit List 1st 2nd 3rd 4th 6th 5th Cut off Marks Merit List Download UP BTC 2013 2014 2015 2016 Admission Notice Fee Structure Reporting Date. 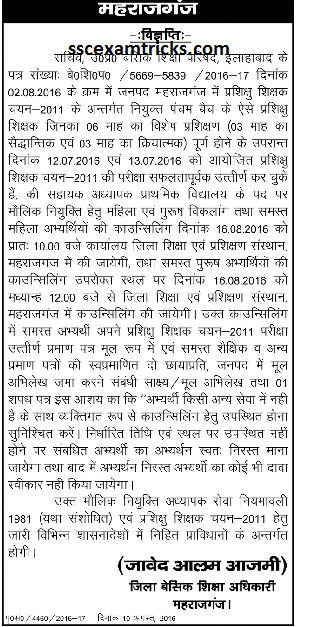 Counseling held on - 29th August 2016. 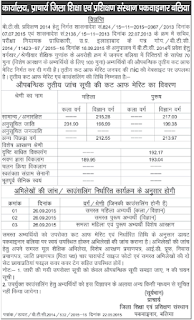 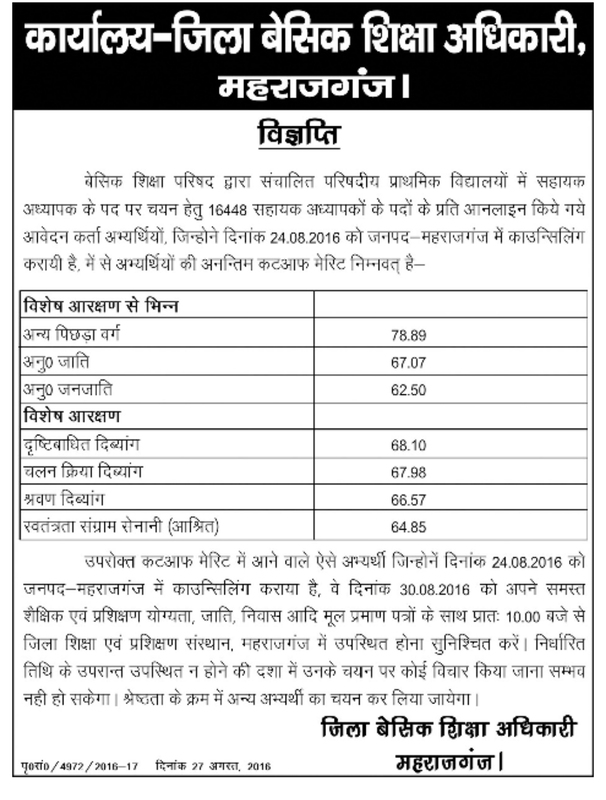 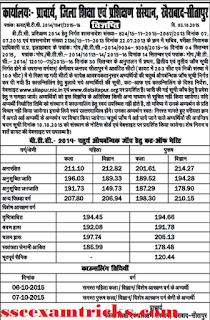 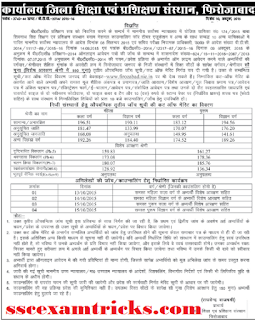 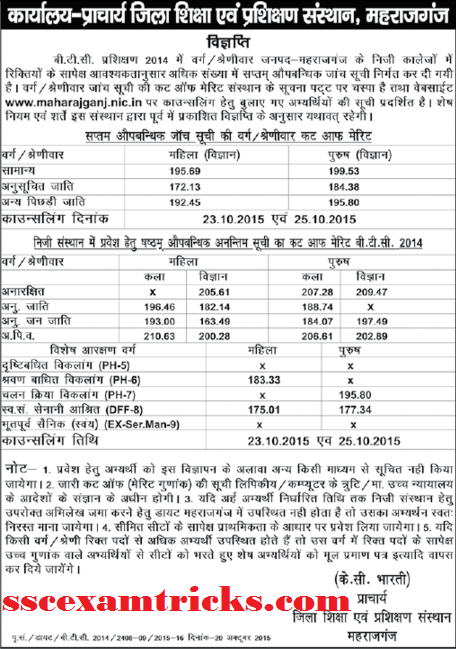 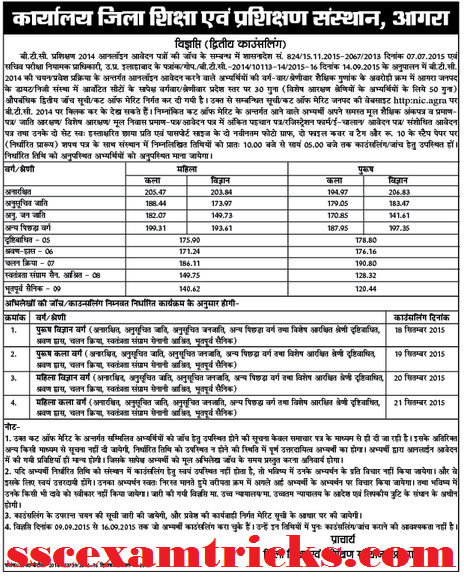 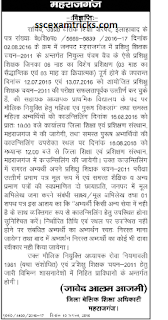 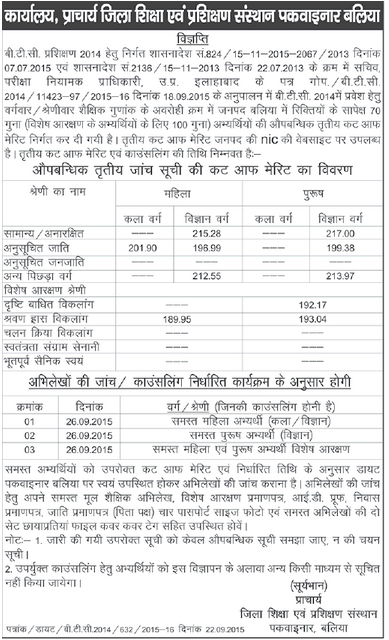 Shahjahanpur Cut off - The UP BTC Shahjahanpur cut off has been published on 31.08.2016. 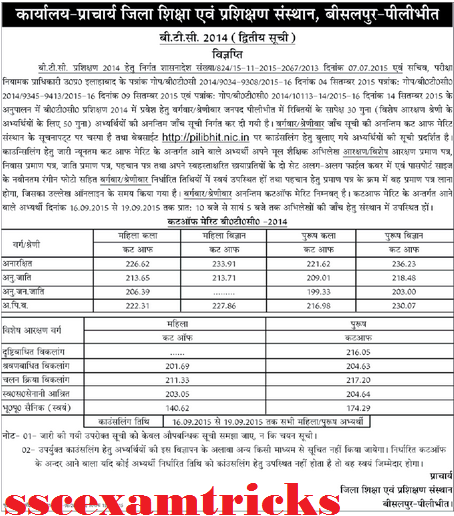 Download the image provided below. 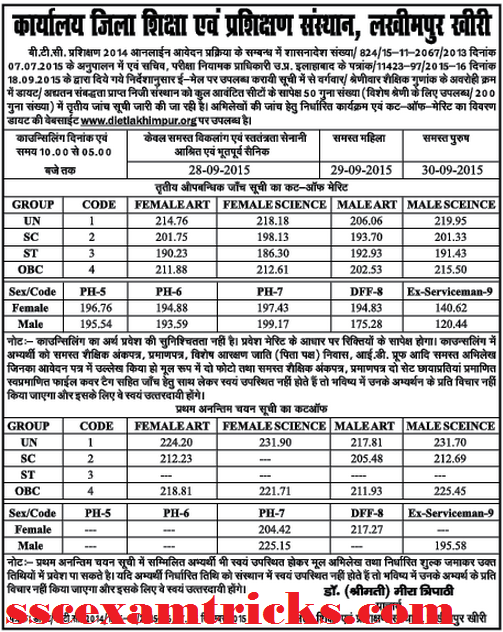 UP BTC 2016 Faizabad Cut off List: Counseling dates are given in the image. 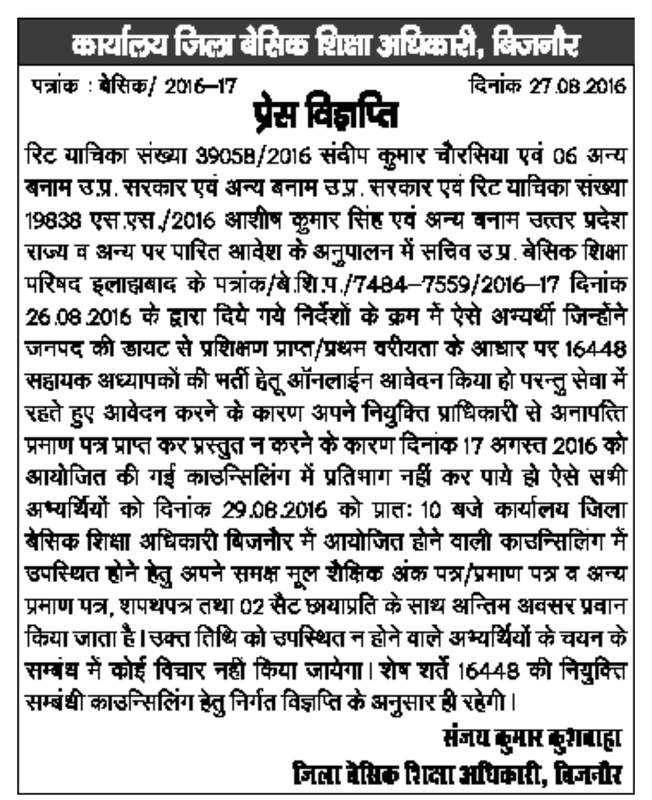 This is good news that 6th Counseling of UP BTC 2014 for Pilibhit district has been published category wise with counseling dates. 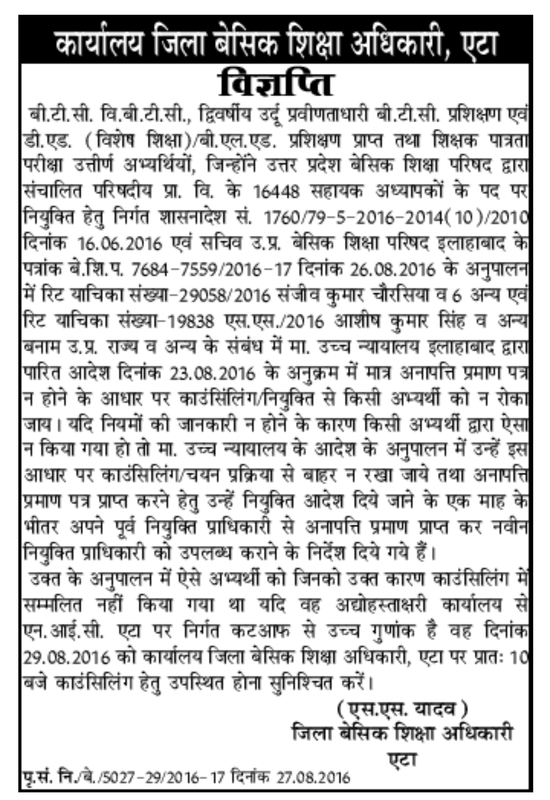 The 6th counseling will be held at DIET Office of the respective districts for the admission to academic session of UP BTC 2014-2015. 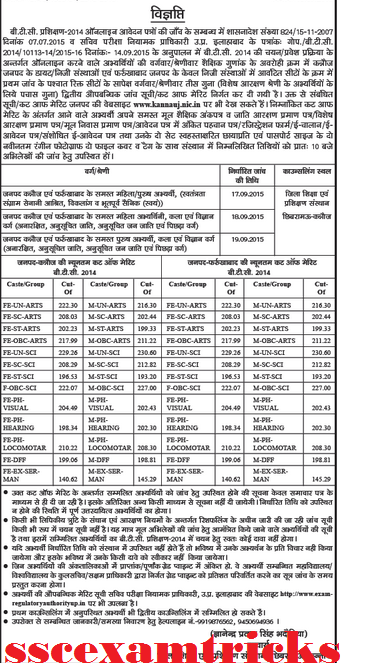 Those candidates who don't get admission after the 5th Counseling they can get admission to 6th 7th counseling here. 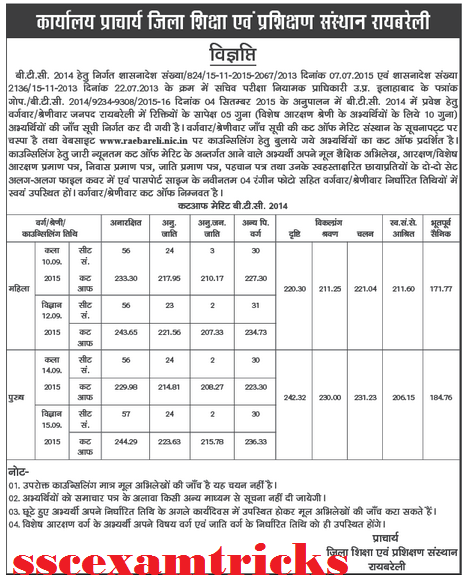 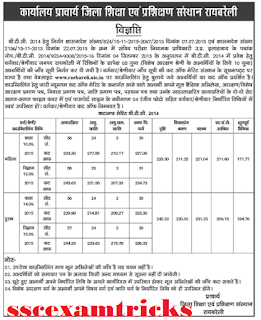 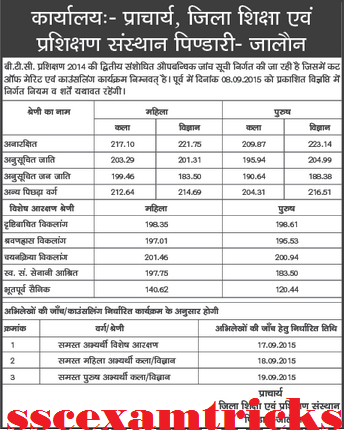 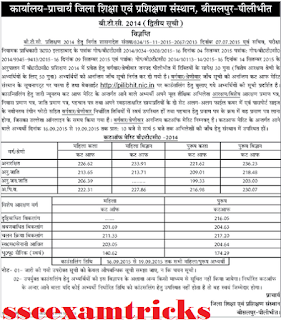 UP BTC 2014 6th Cut off: The district wise cut off is discussed in the image provided below. 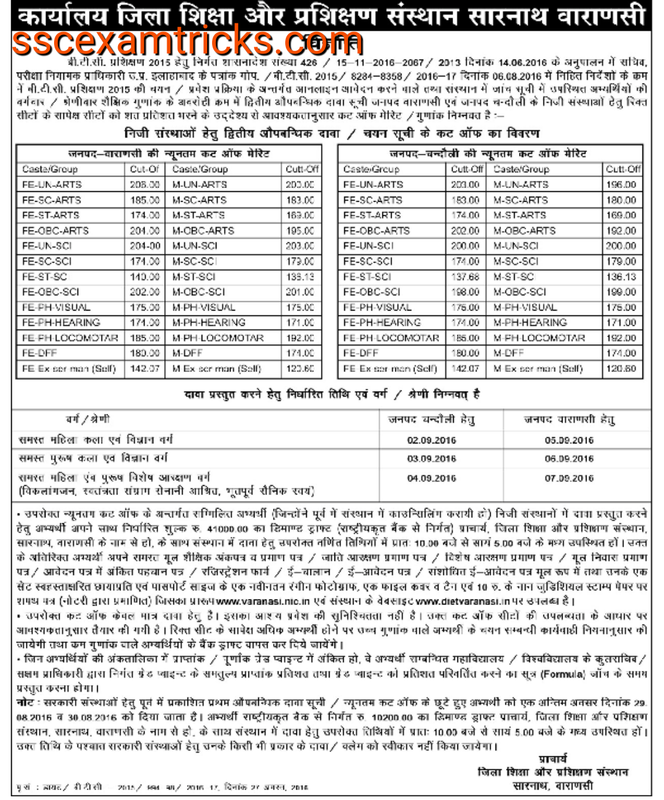 Fee: 41000/- (Demand Draft to Principal, DIET. 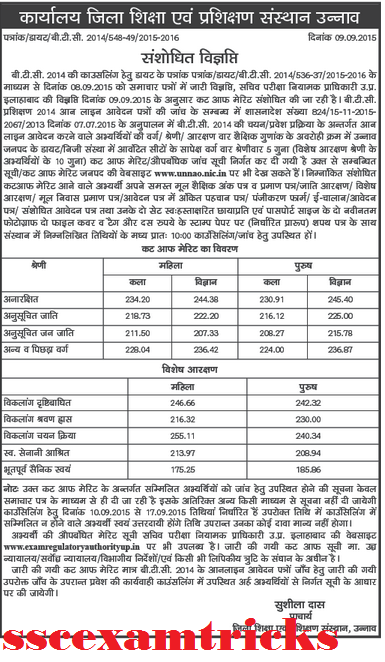 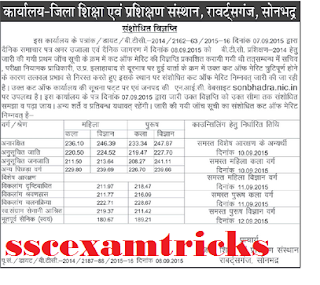 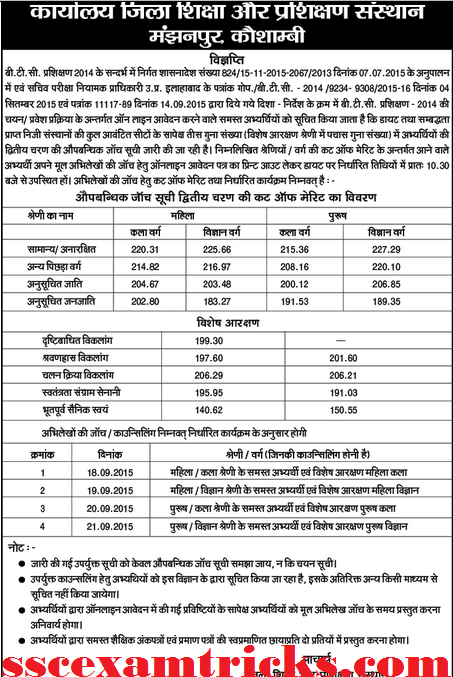 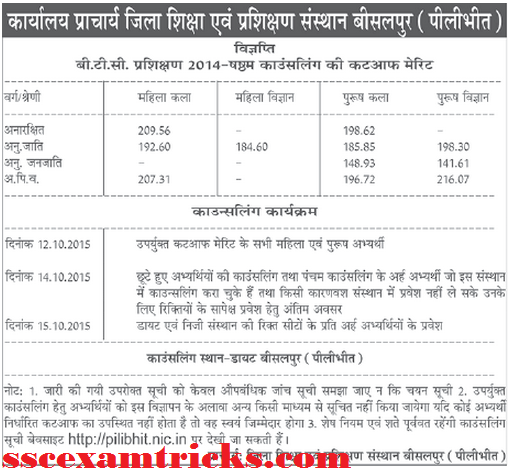 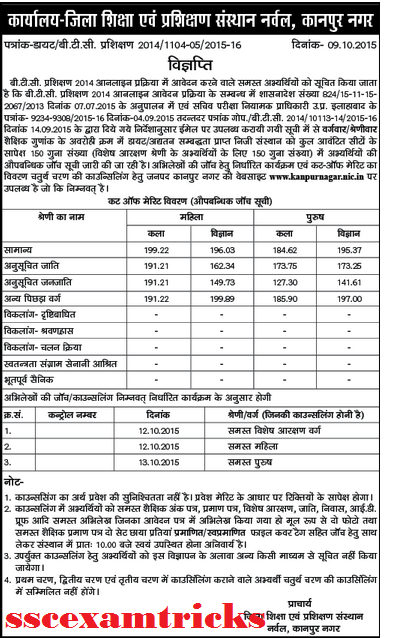 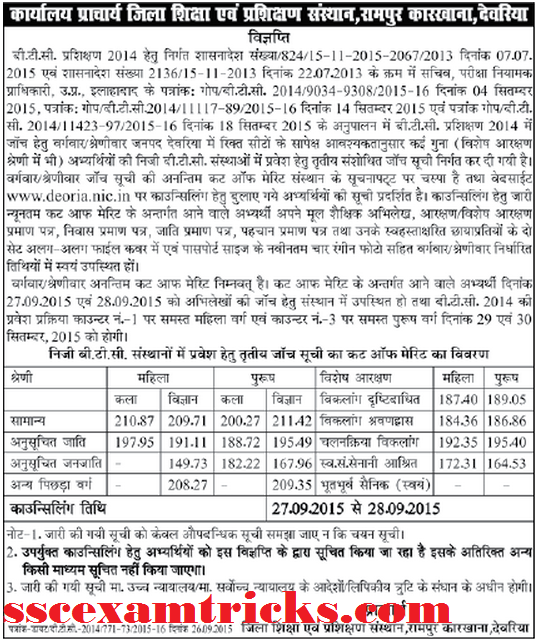 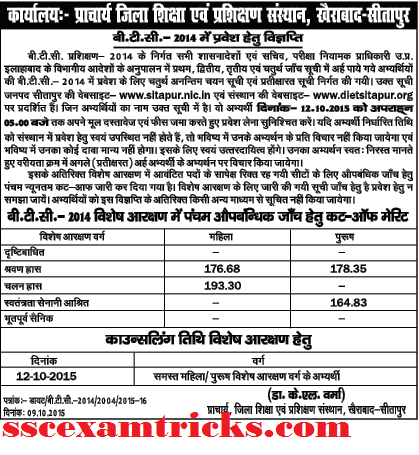 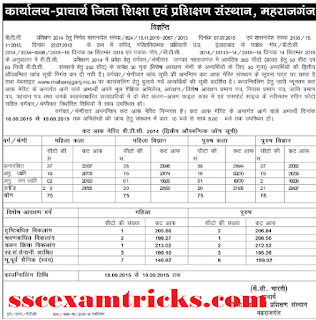 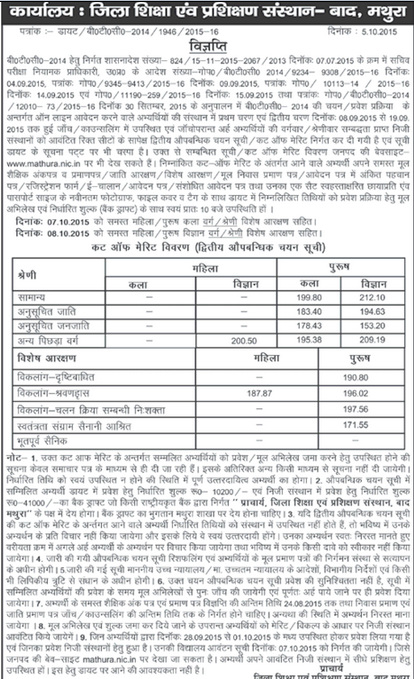 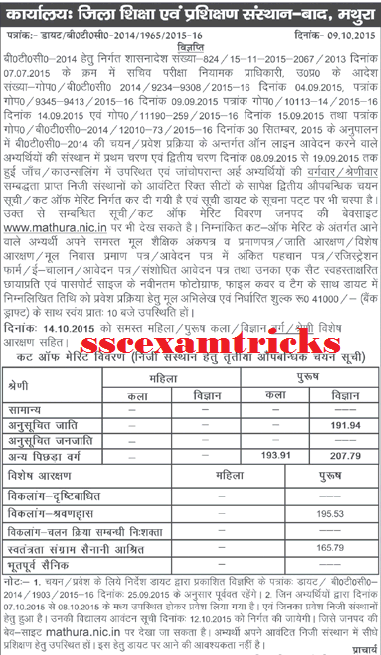 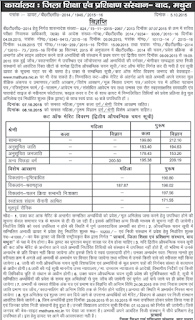 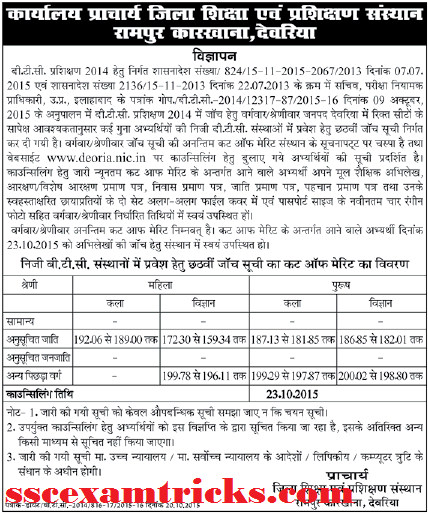 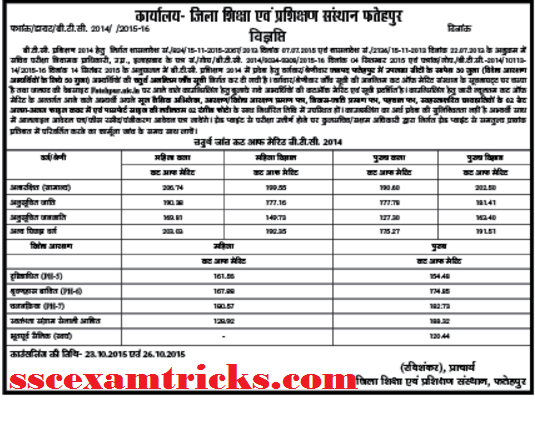 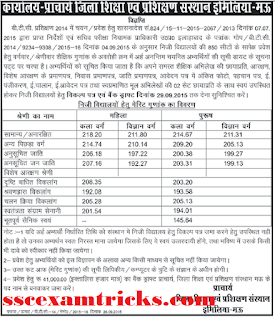 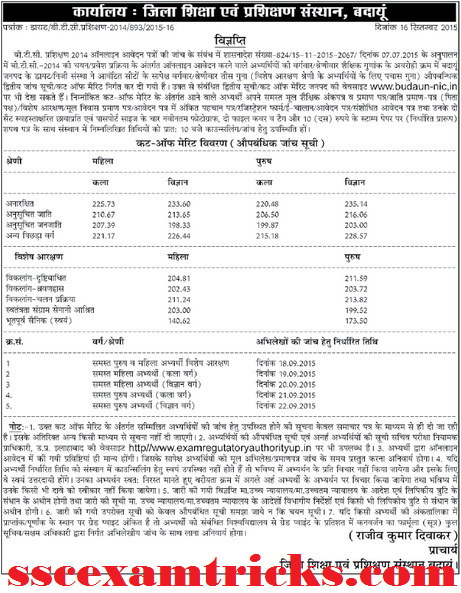 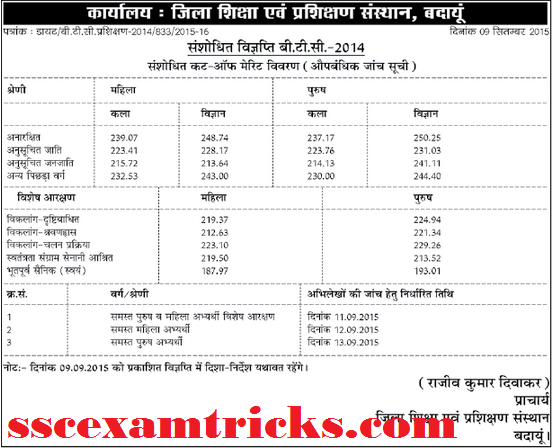 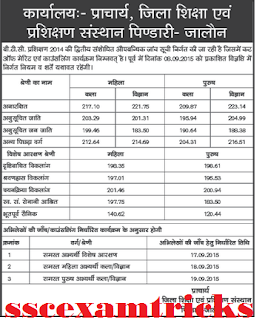 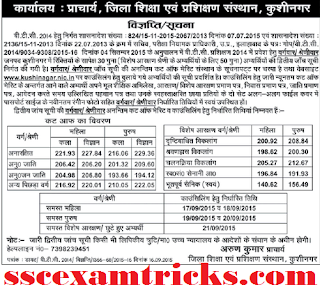 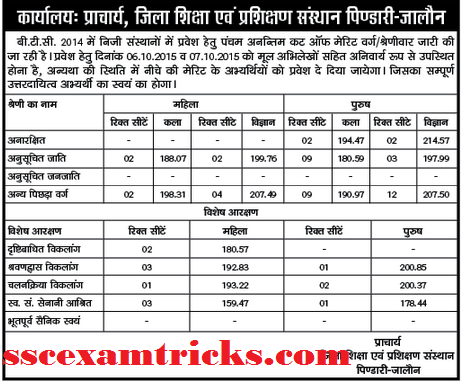 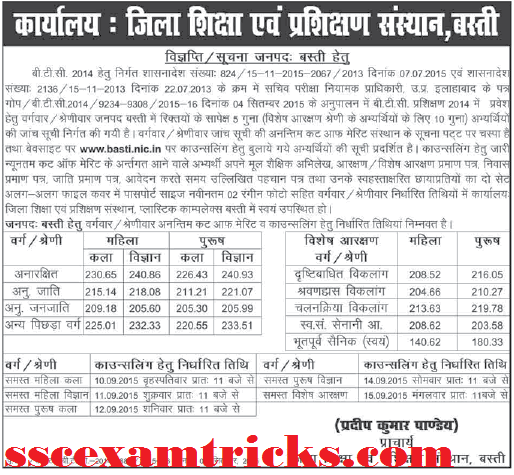 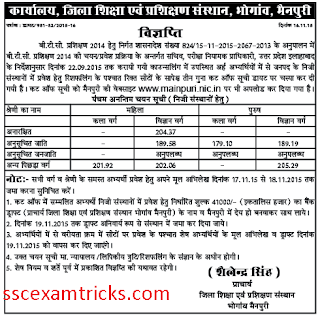 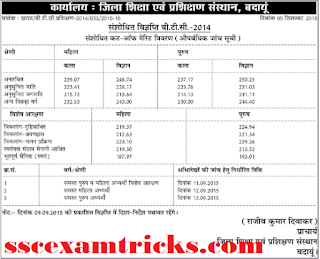 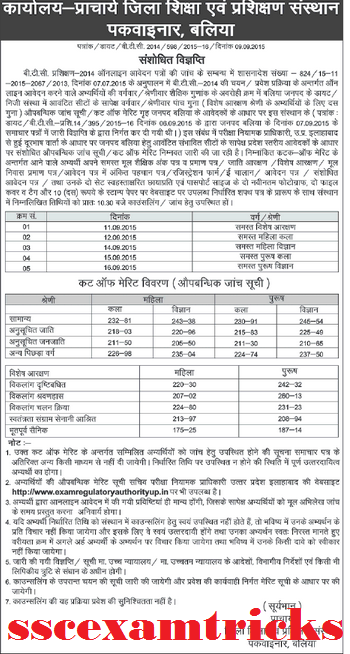 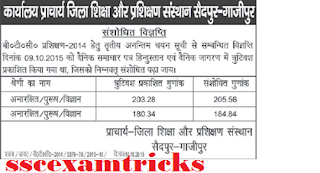 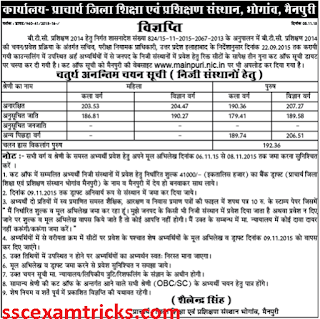 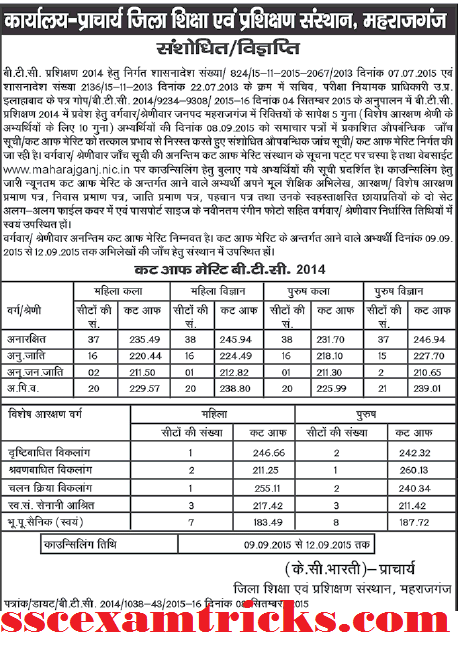 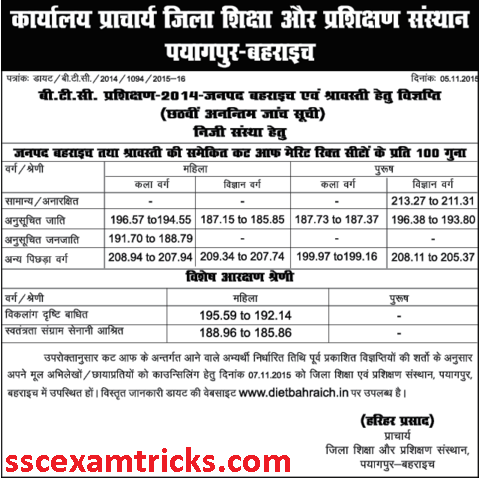 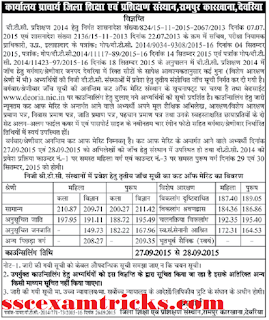 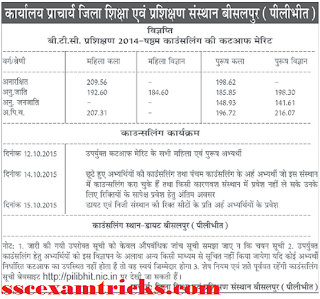 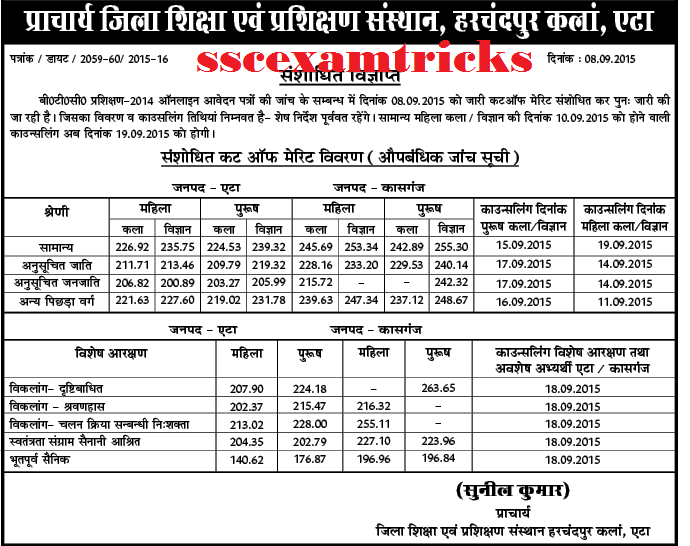 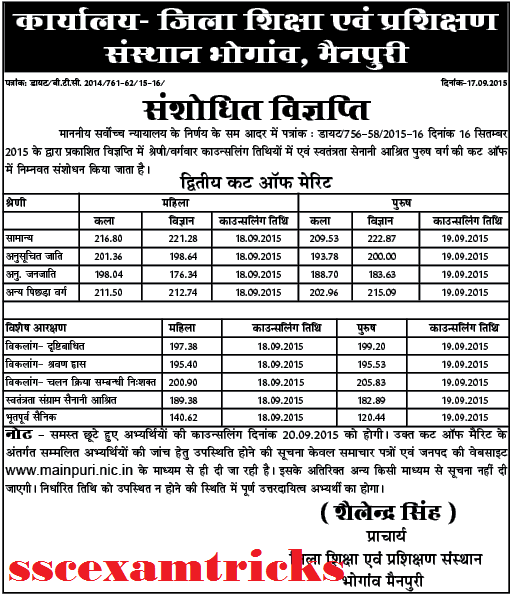 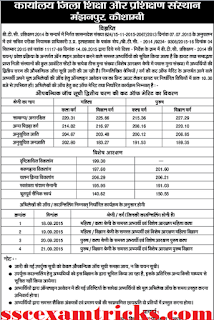 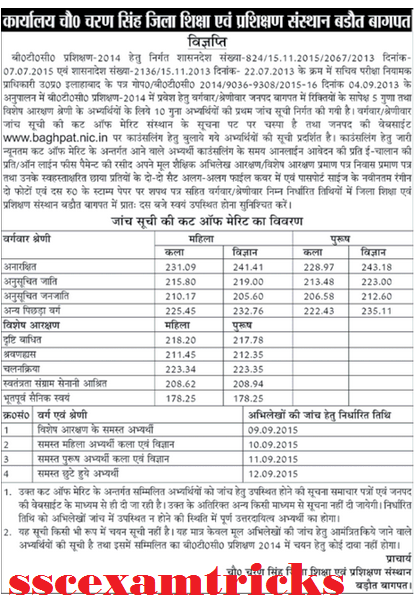 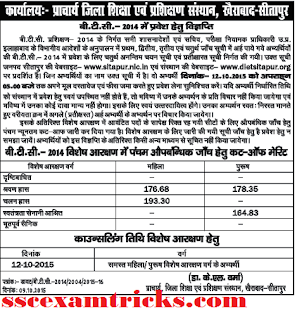 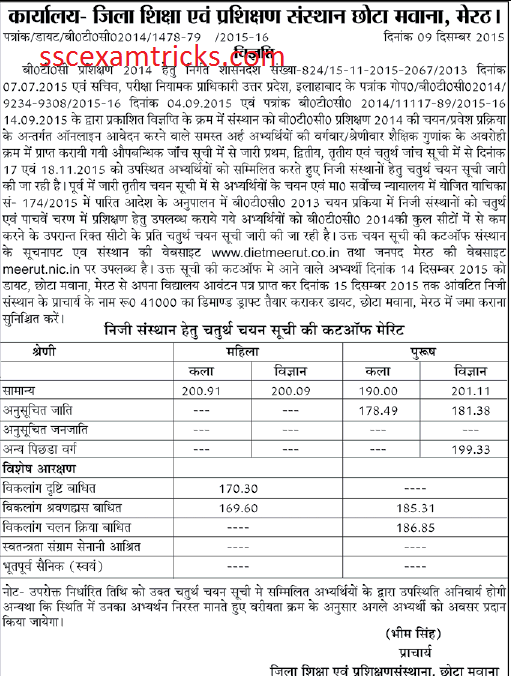 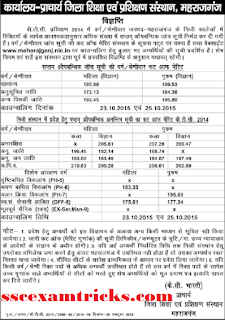 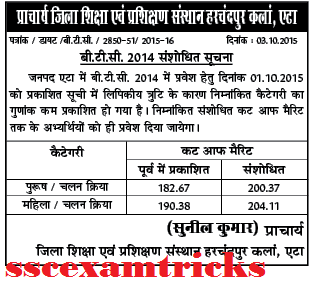 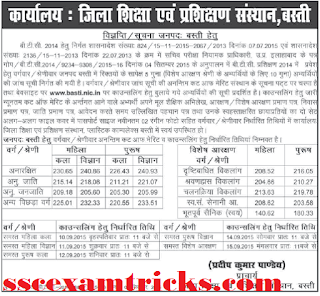 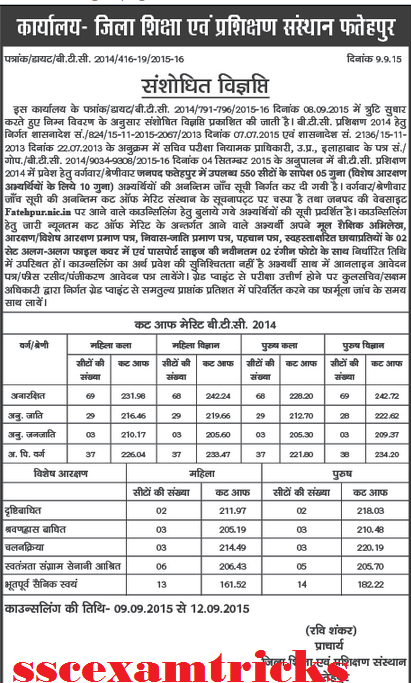 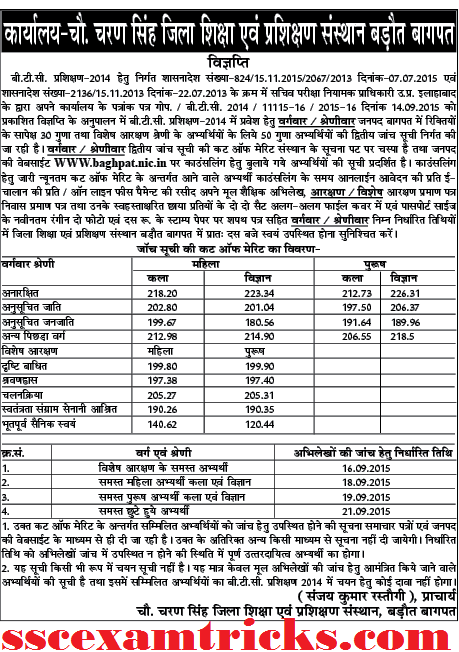 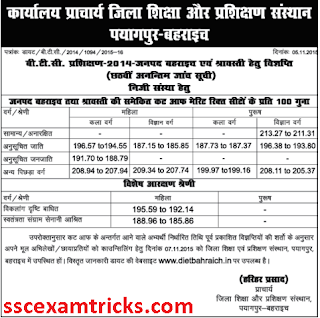 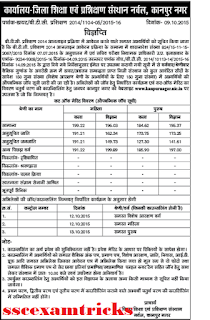 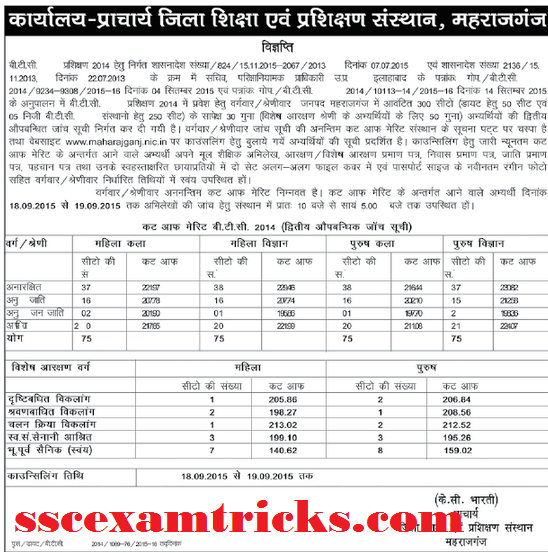 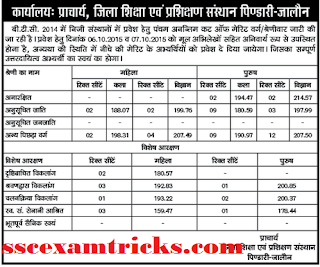 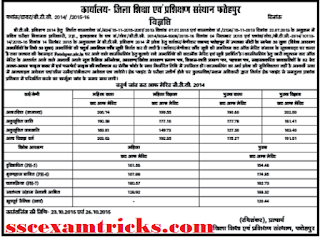 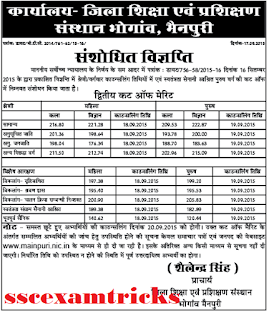 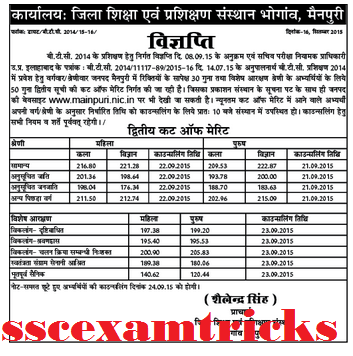 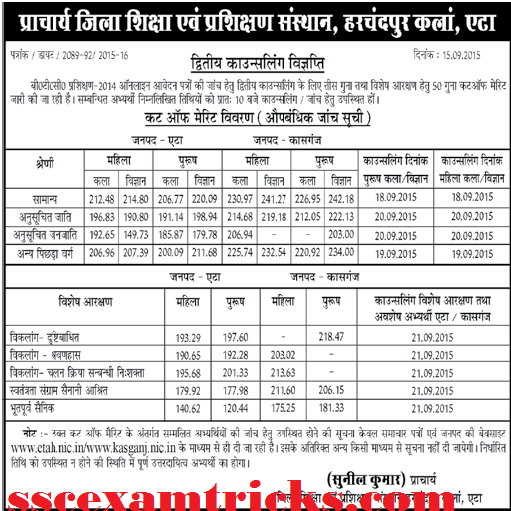 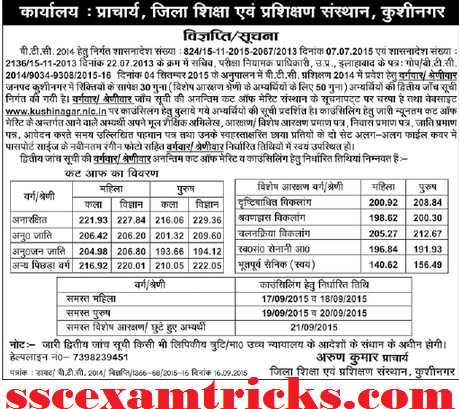 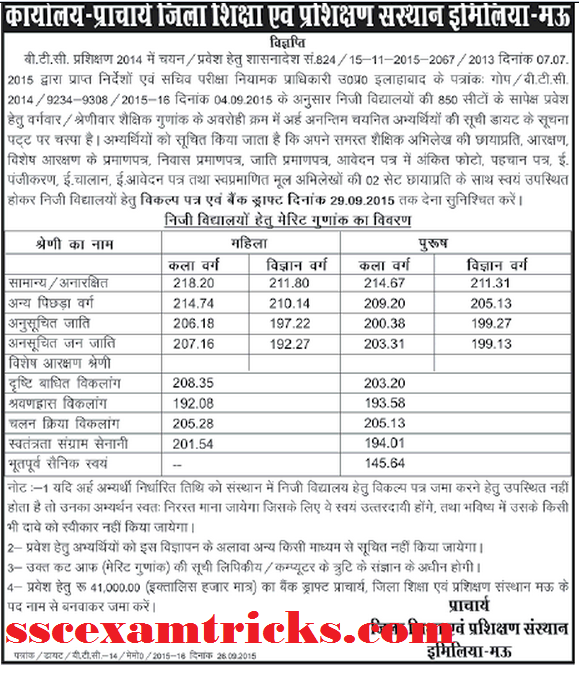 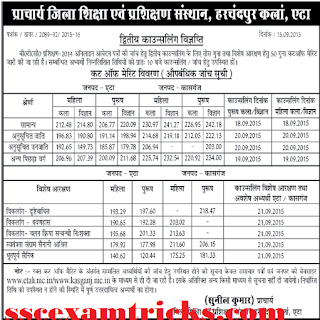 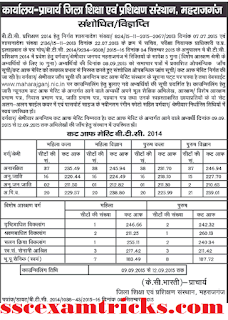 Official website to download UP BTC 2014 Cutoff merit list for Mawana - Meerut: www.meerut.nic.in & www.dietmeerut.co.in. 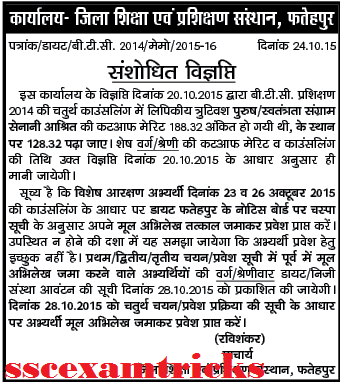 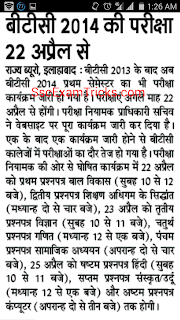 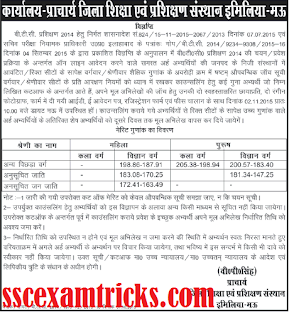 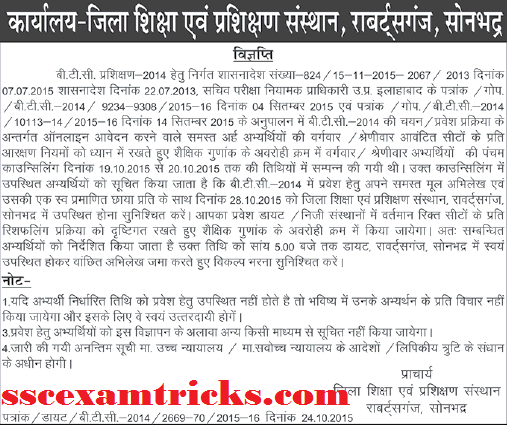 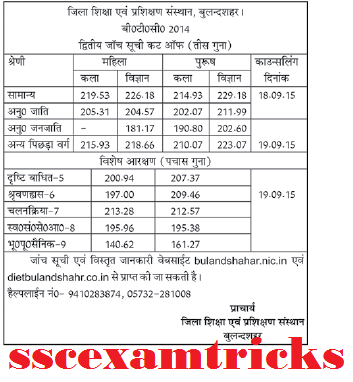 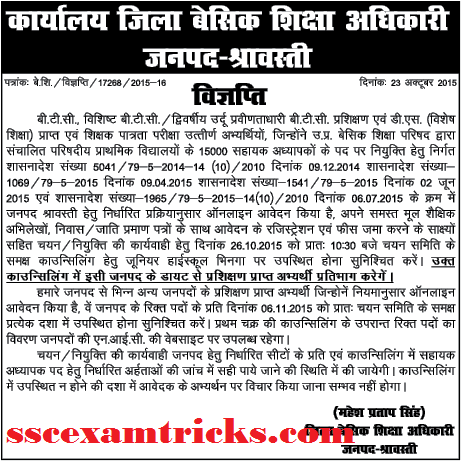 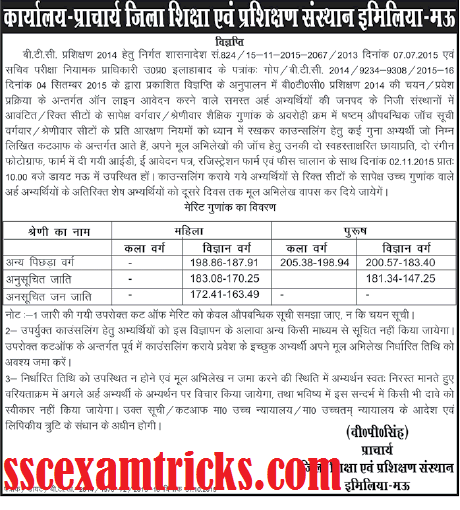 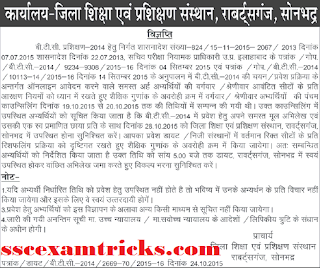 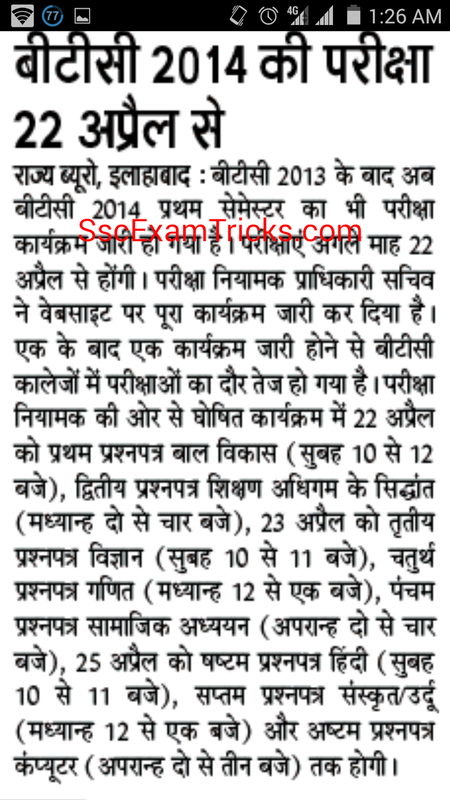 The latest news is here for you that Uttar Pradesh has published 5th cut off merit list for BTC 2014 2015 3rd counseling. 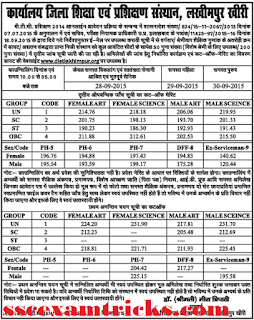 The 5th cut off has been uploaded with category wise minimum marks for male and female candidates. 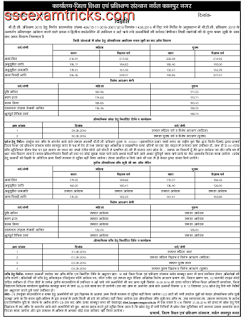 The instructions is provided to those candidates who have been selected and are going to submitting their documents in the regional offices. 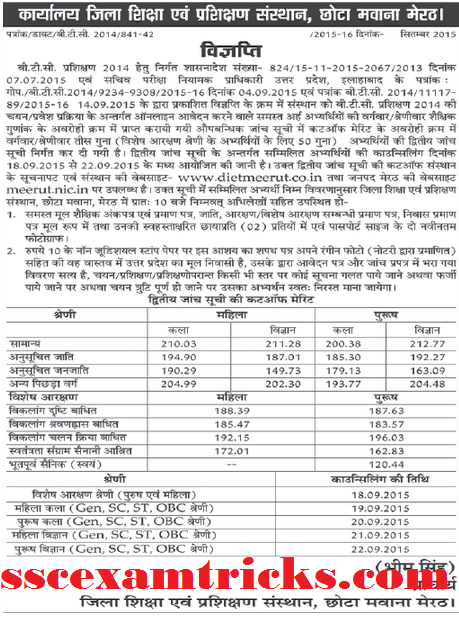 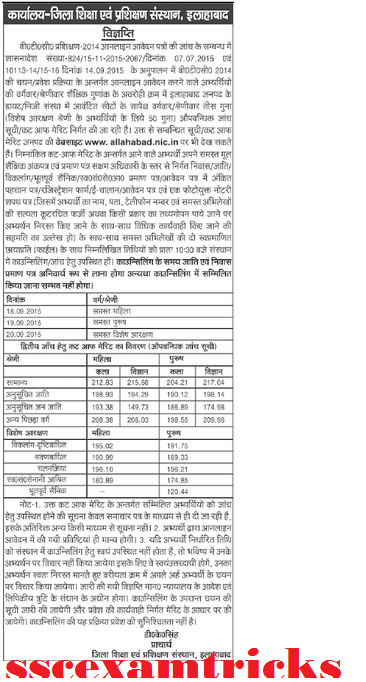 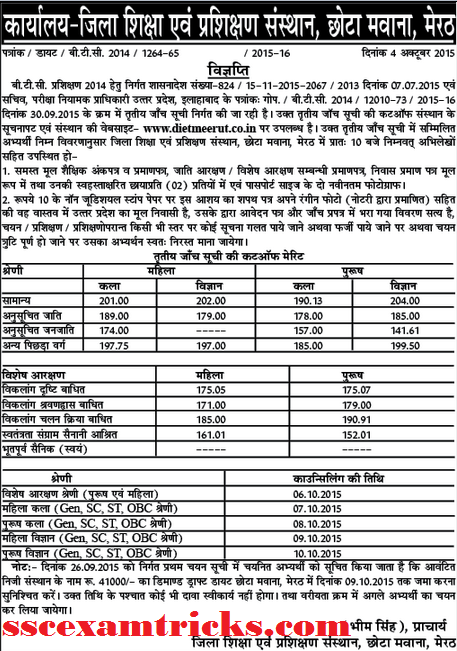 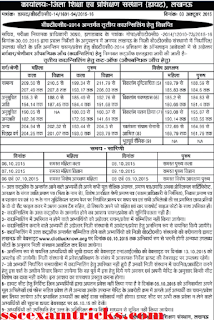 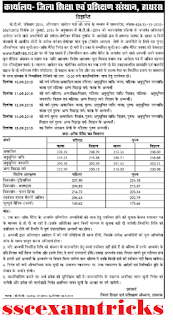 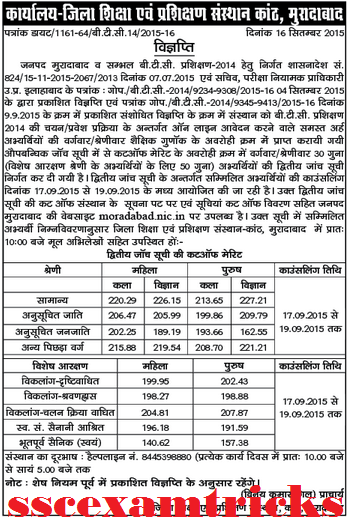 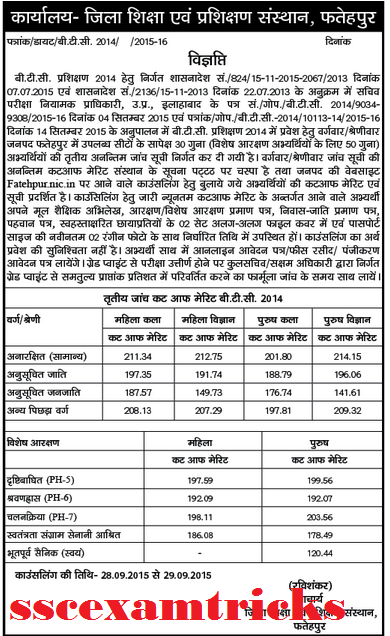 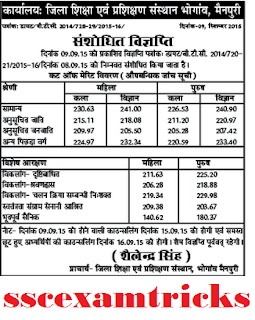 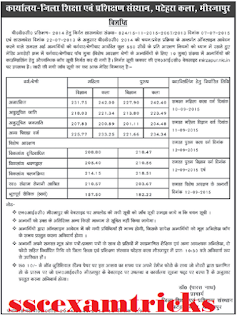 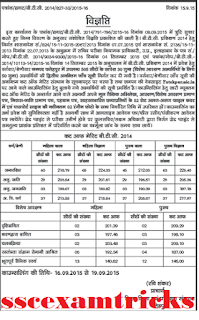 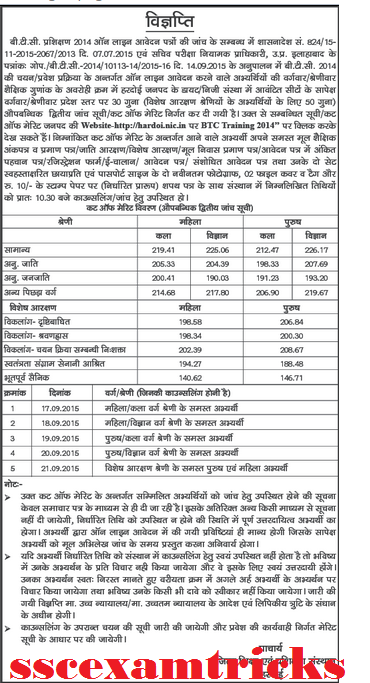 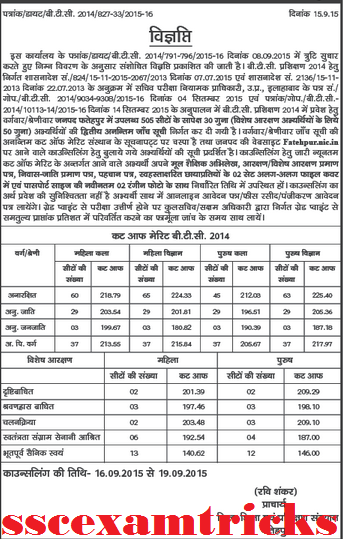 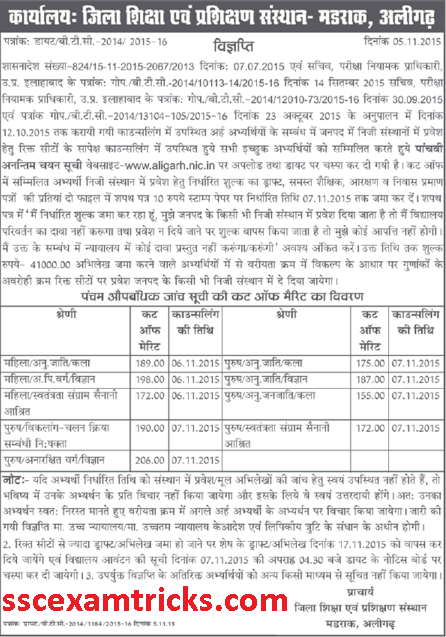 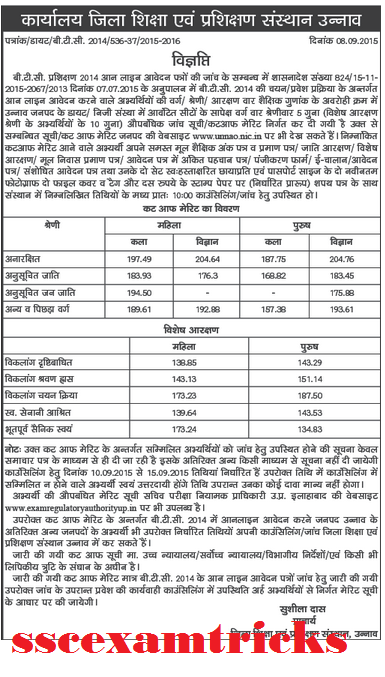 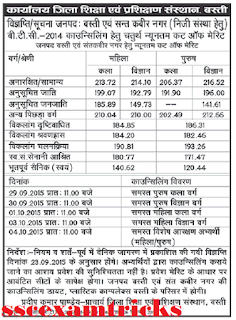 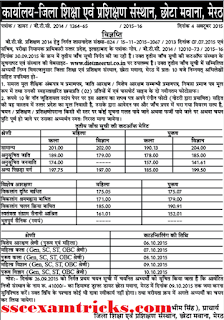 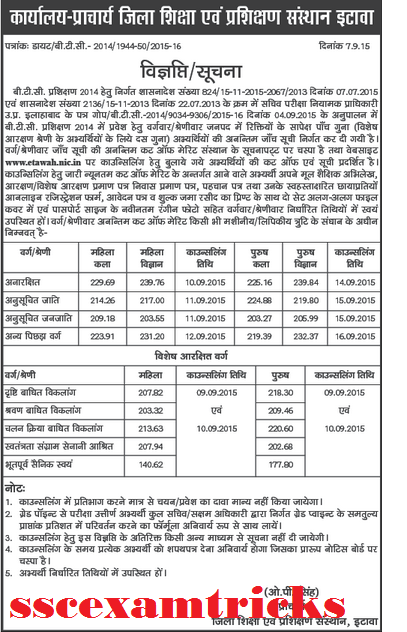 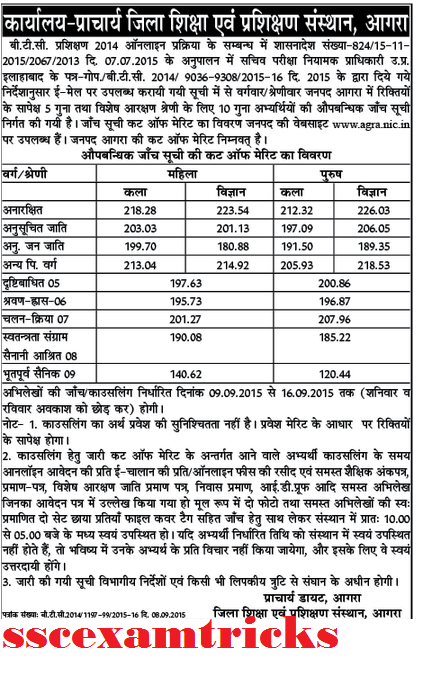 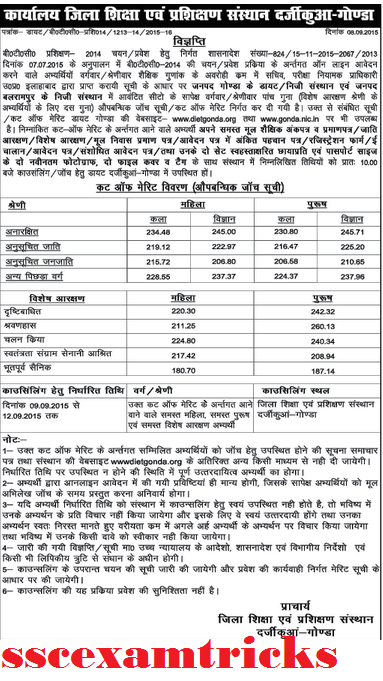 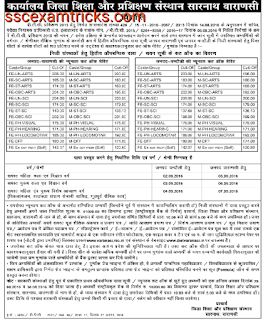 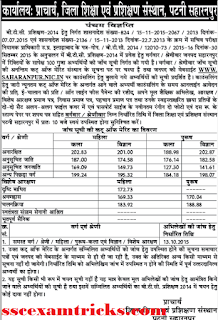 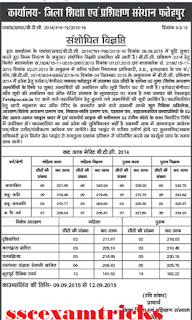 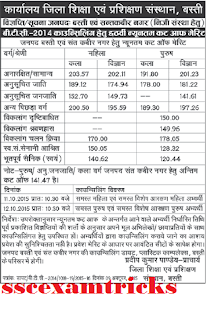 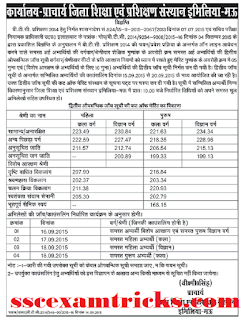 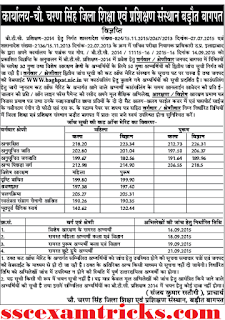 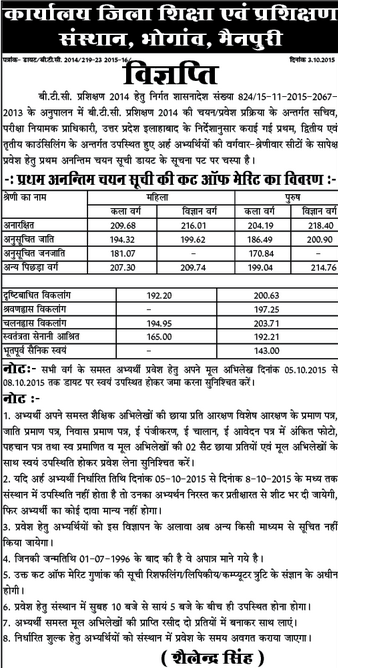 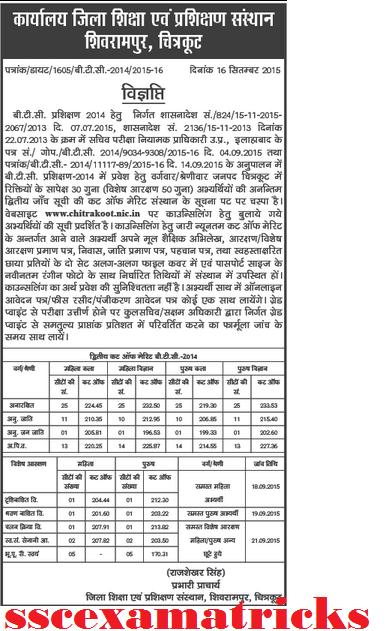 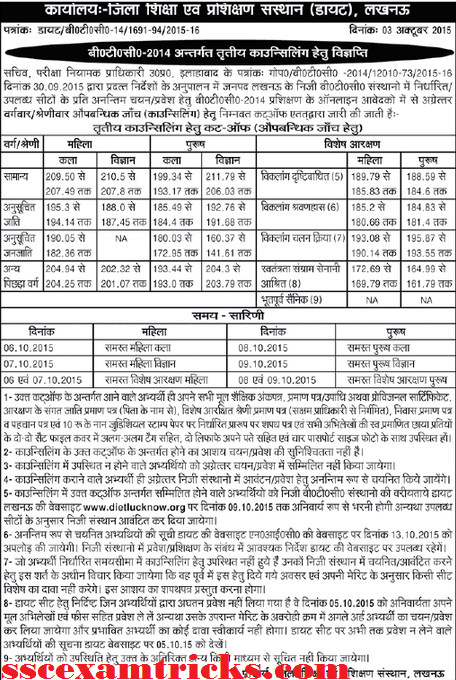 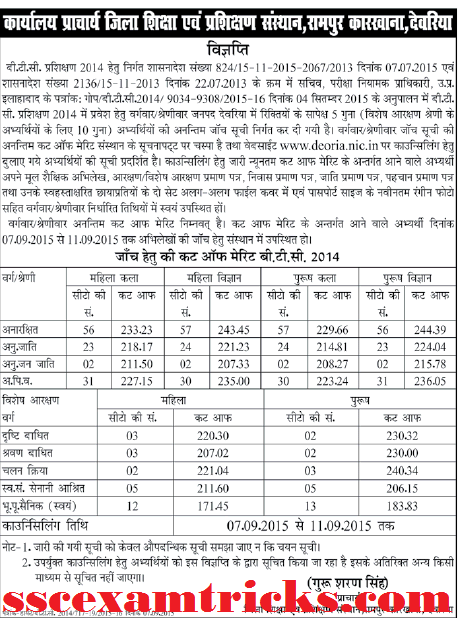 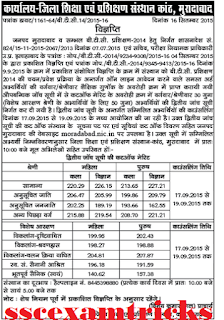 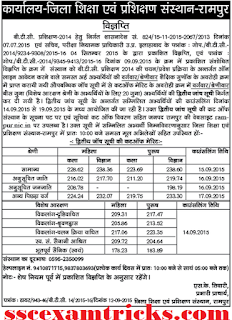 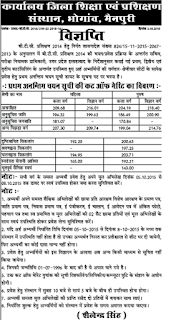 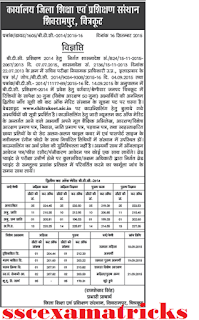 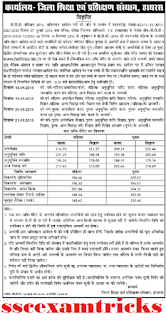 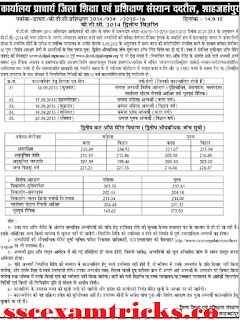 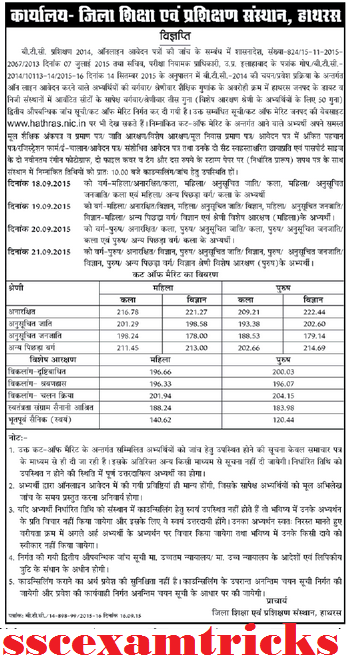 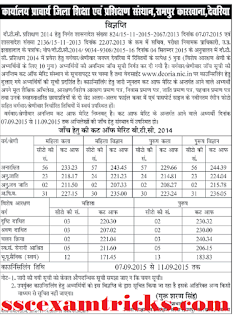 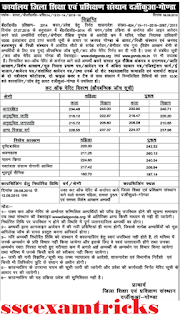 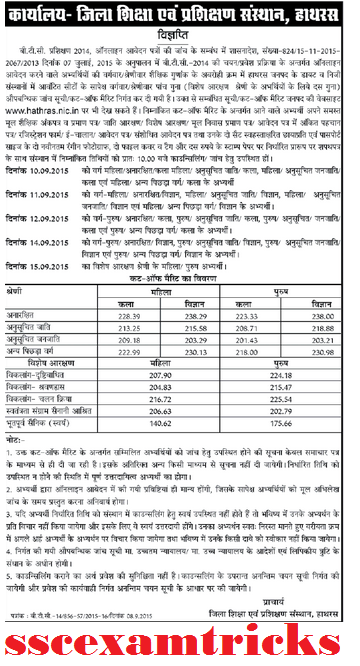 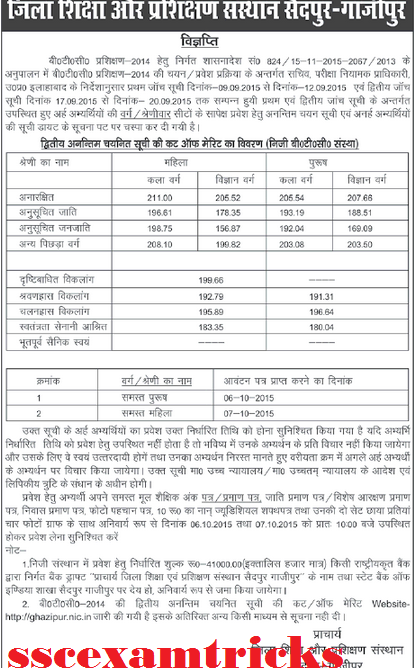 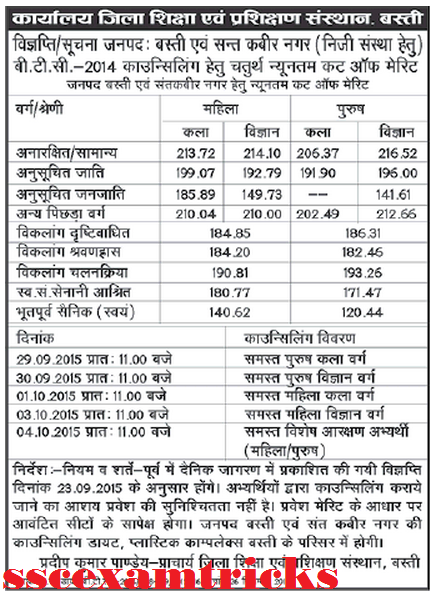 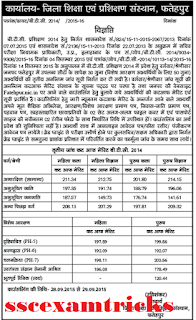 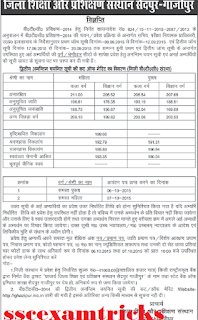 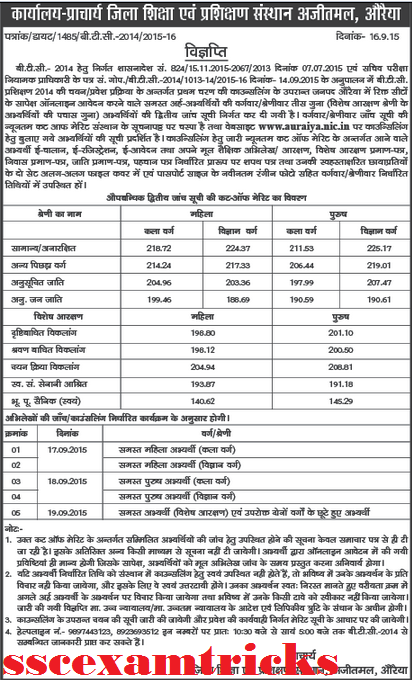 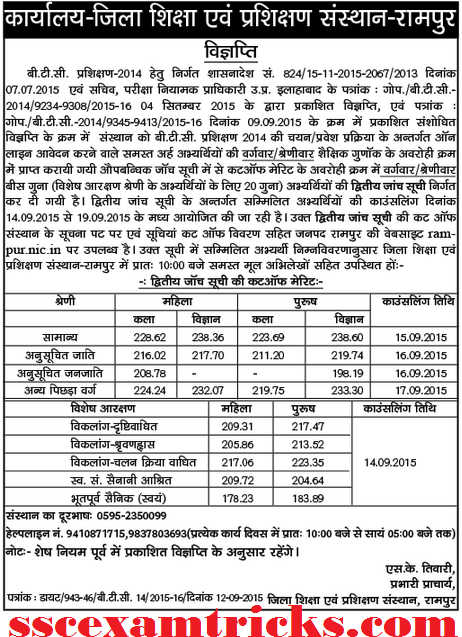 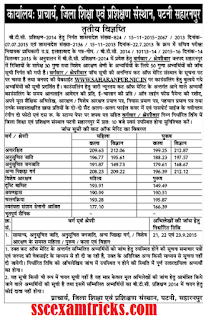 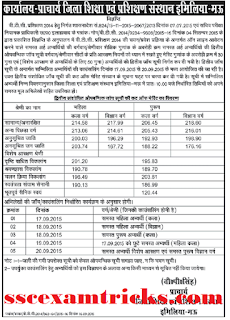 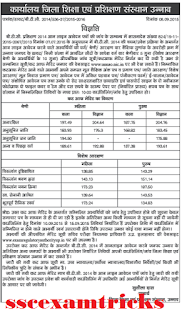 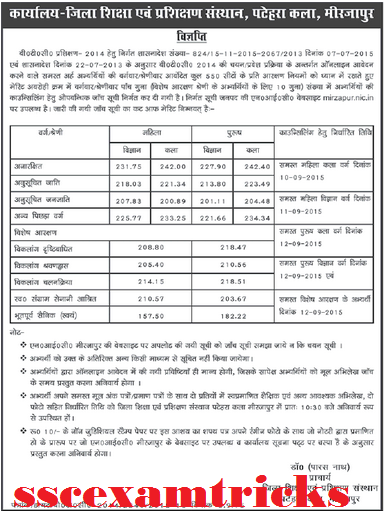 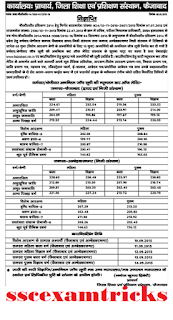 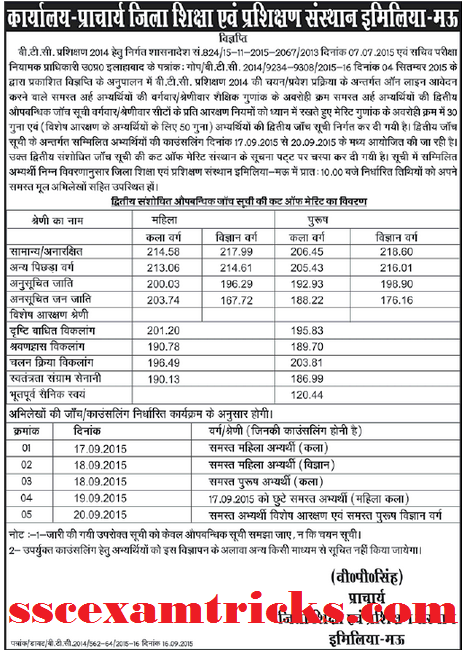 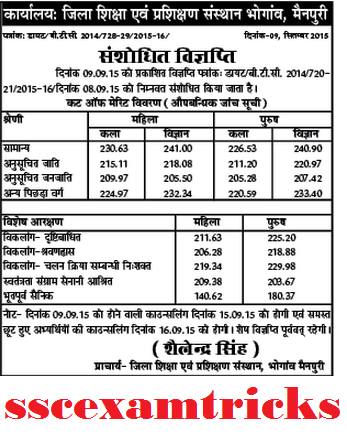 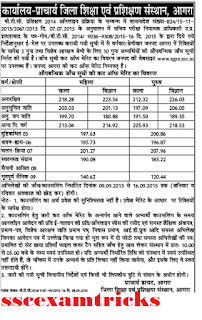 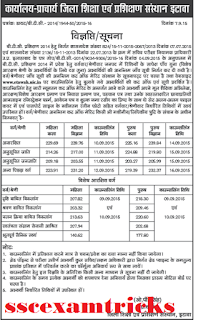 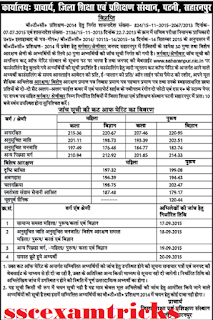 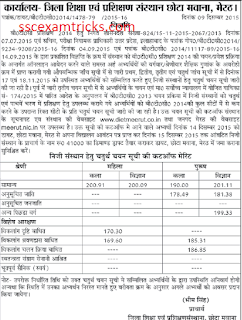 UP BTC 2014 5th cut off for district Basti has been released. 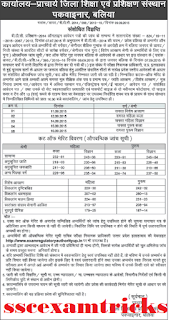 Candidates can download it from image given below. 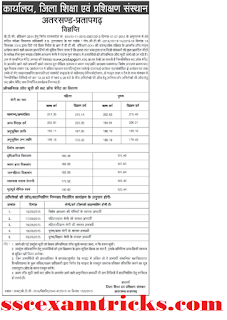 Candidates can download their counseling letter and advised to contact their respective DIET (District Institute of Education & Training) in respective districts i.e. 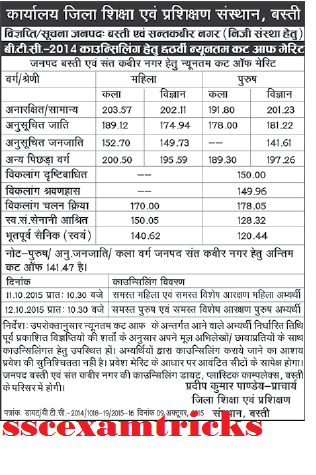 various districts of Uttar Pradesh. 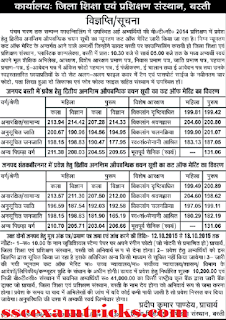 The latest news is that UP BTC 2014 2015 1st, 2nd, 3rd, 4th, 5th Cut off list of various districts Chandauli , Chitrakoot , Deoria , Etah , Etawah , Faizabad , Farukkhabad , Fatehpur , Firozabad , Gautam Buddha Muzaffar Nagar , Pilibhit , Pratapgarh , Raebareli , Rampur , Saharanpur ,Kanpur Dehat , Kanpur Nagar , Kaushambi , Kushi Nagar (Padrauna) , Lakhimpur Kheri , Auraiya , Azamgarh , Baghpat , Bahraich , Ballia , Balrampur , Banda , Barabanki , Bareilly , Basti , Bijnor , Nagar , Lalitpur , Lucknow , Maharajganj , Mahoba , Mainpuri , Mathura , MAU , Meerut , Mirzapur , Moradabad ,Agra , Aligarh , Allahabad , Ambedkar Nagar , Ghaziabad , Ghazipur , Gonda , Gorakhpur , Hamirpur , Hardoi , Hathras , Jalaun , Jaunpur , Jhansi , Jyotiba Phoole Nagar , Kannauj , Budaun , Bulandshahar , Sant Kabir Nagar , Sant Ravidas Nagar , Shahjahanpur , Shravasti , Siddharth Nagar , Sitapur , Sonbhadra , Sultanpur , Unnao , Varanasi has published. 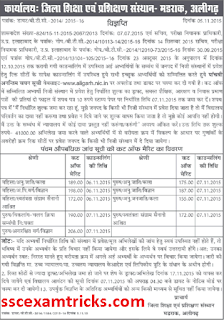 You can get admission notice in which reporting date/ documents list has mentioned. 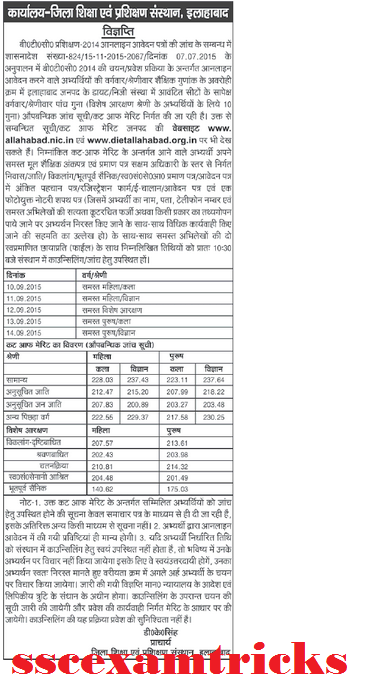 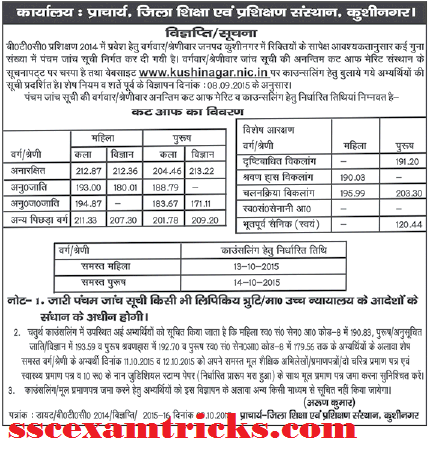 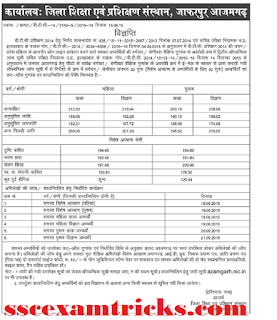 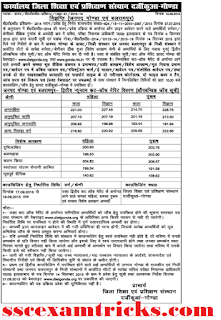 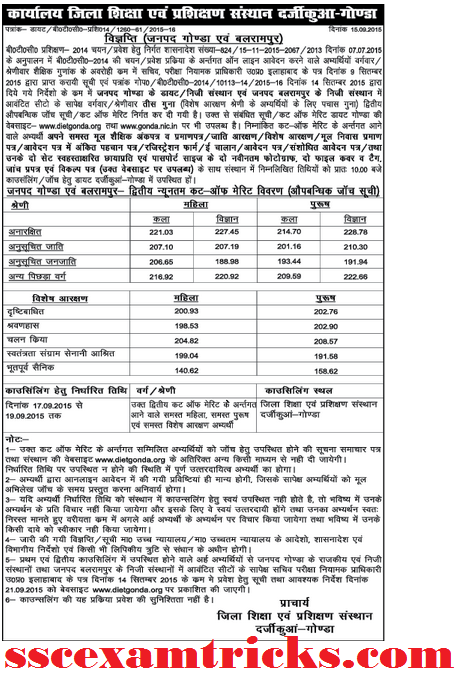 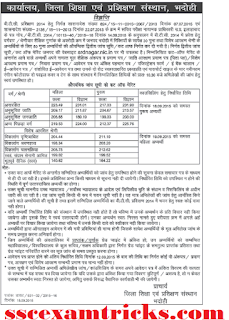 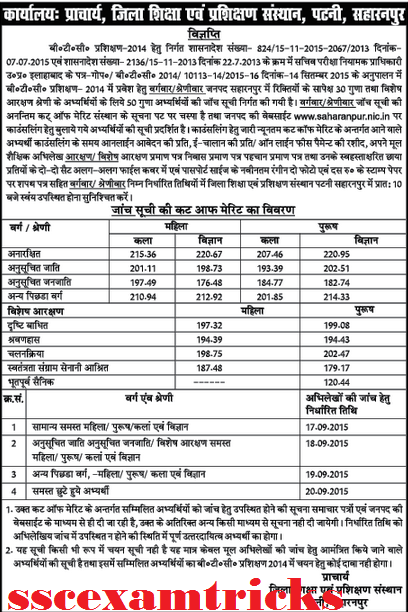 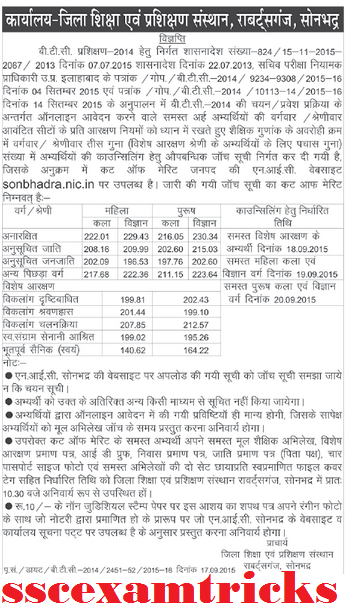 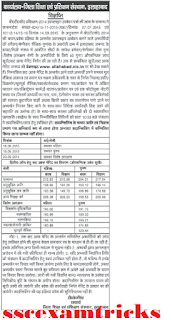 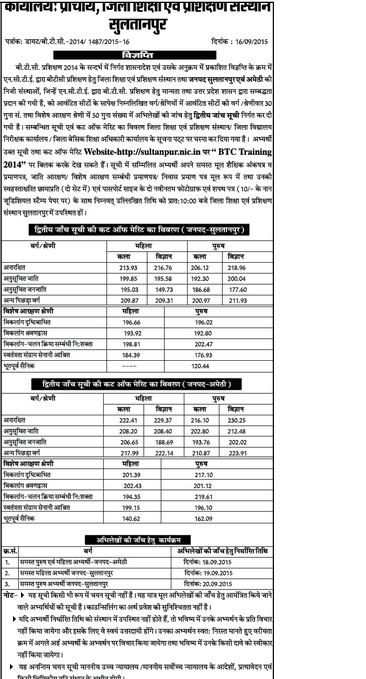 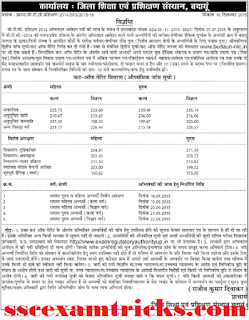 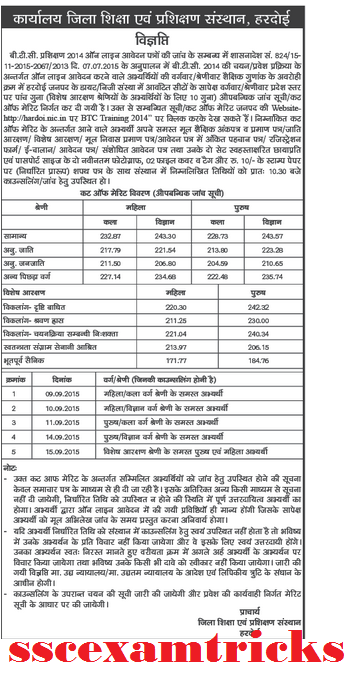 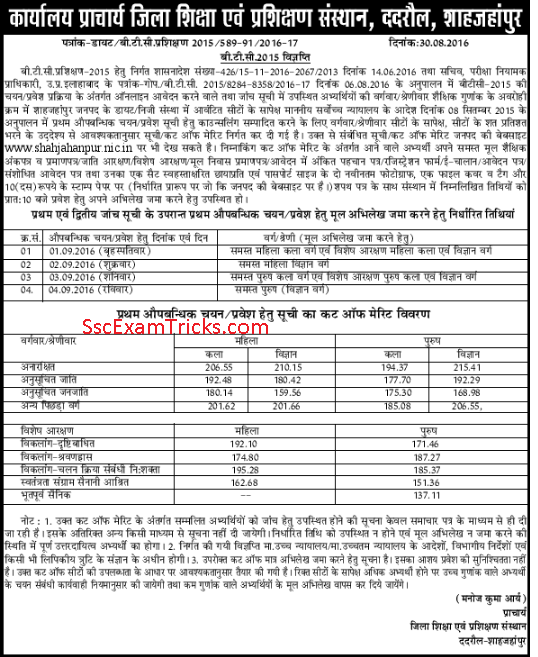 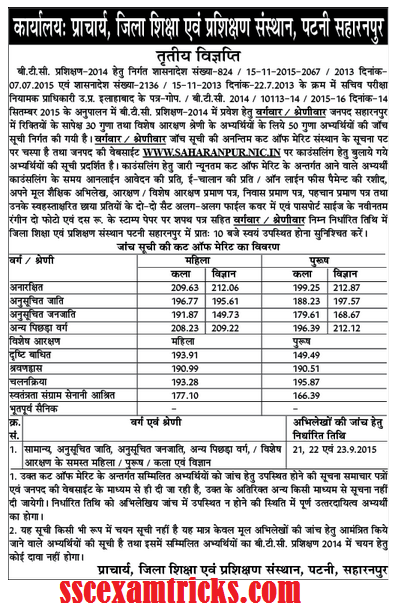 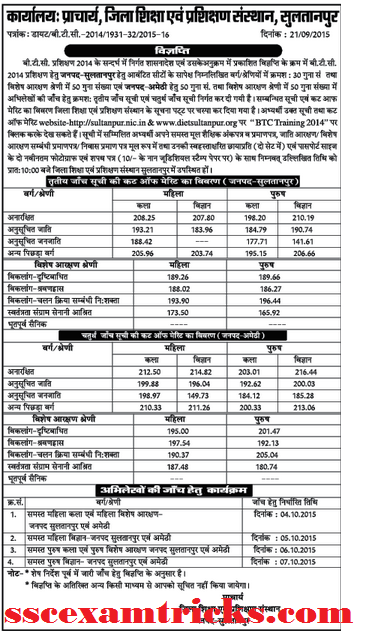 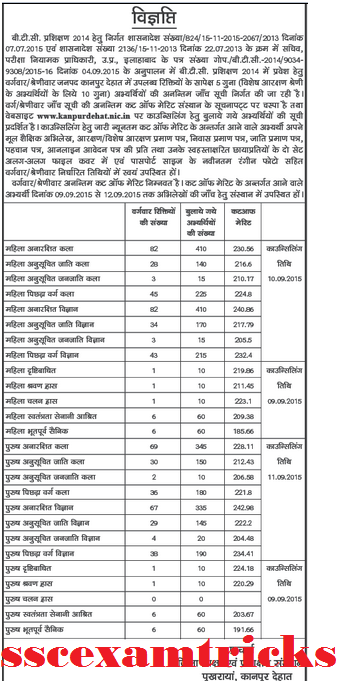 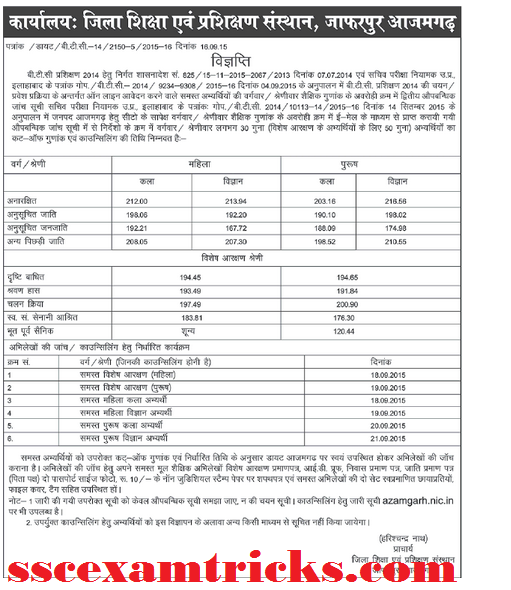 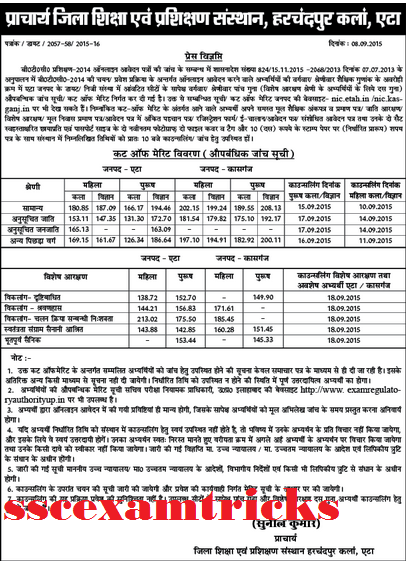 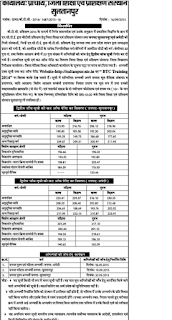 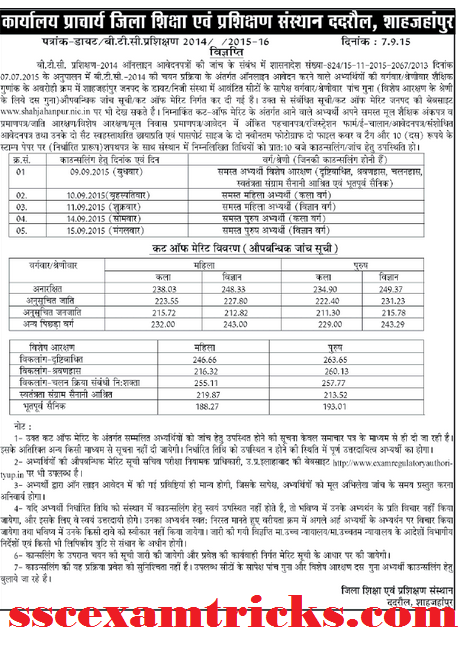 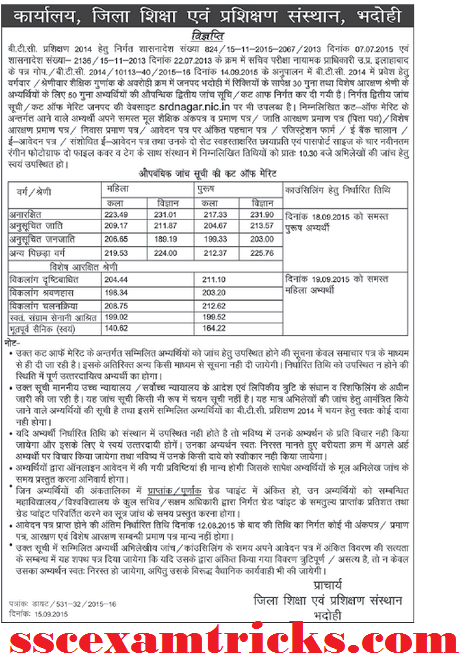 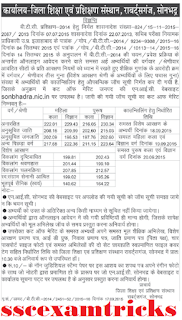 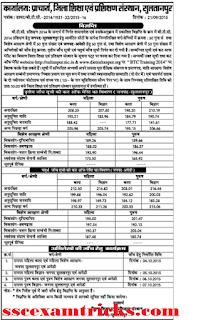 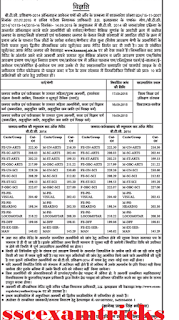 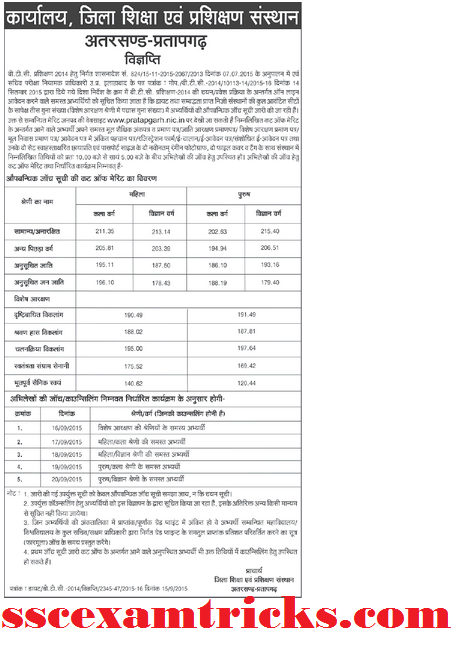 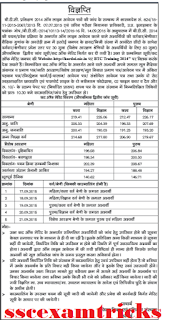 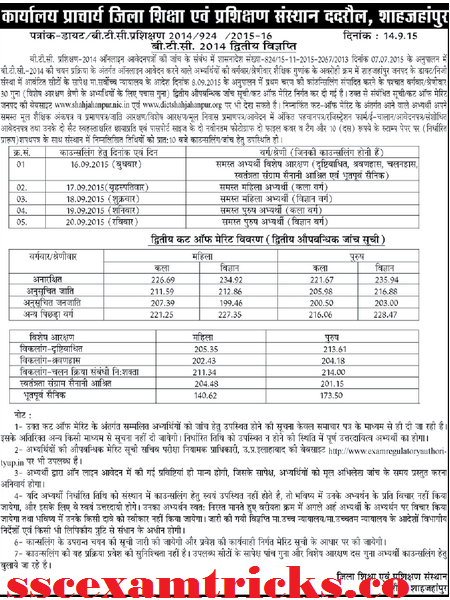 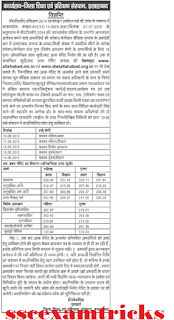 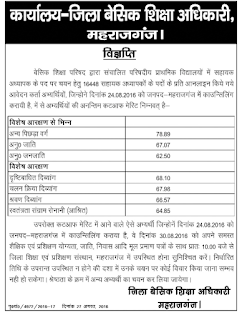 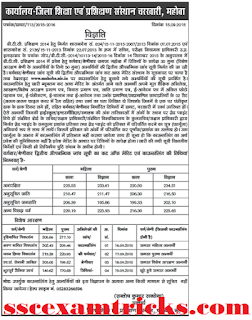 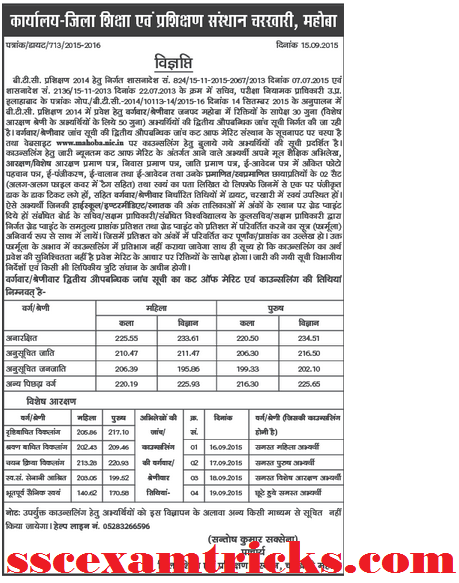 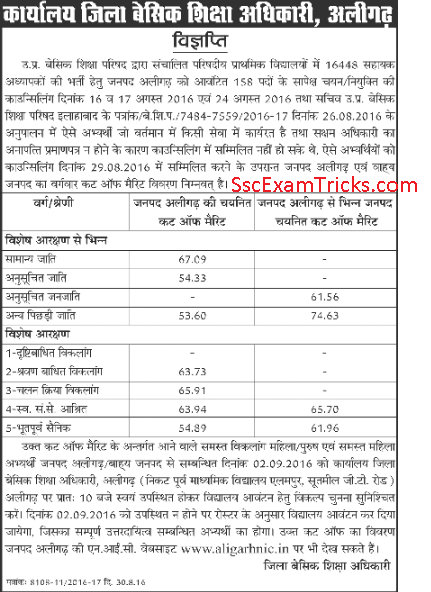 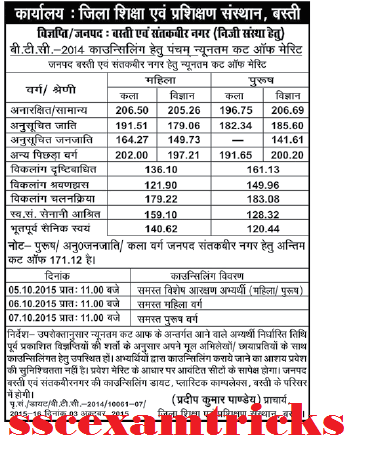 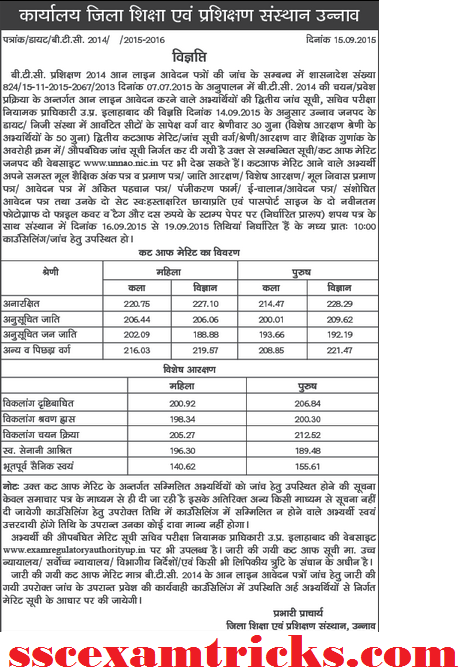 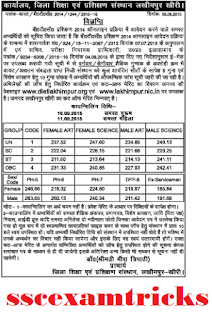 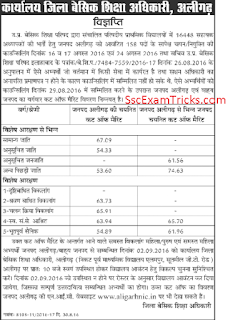 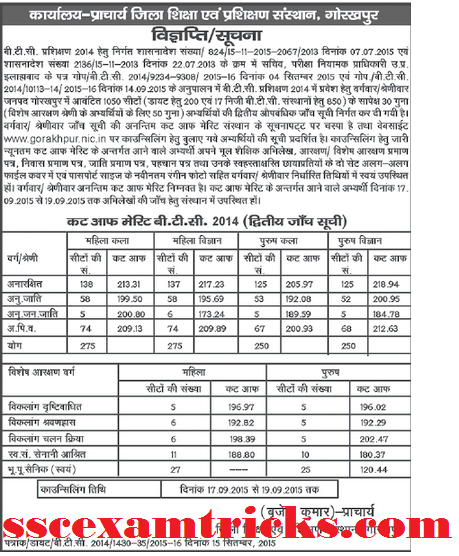 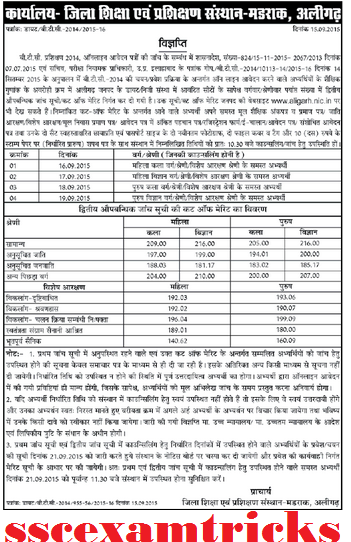 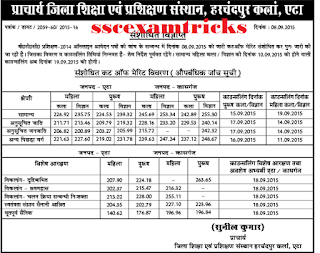 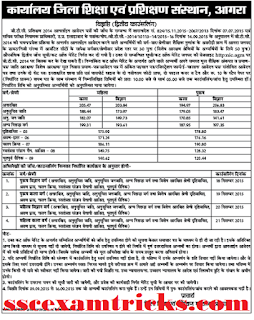 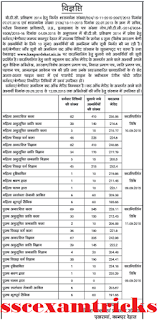 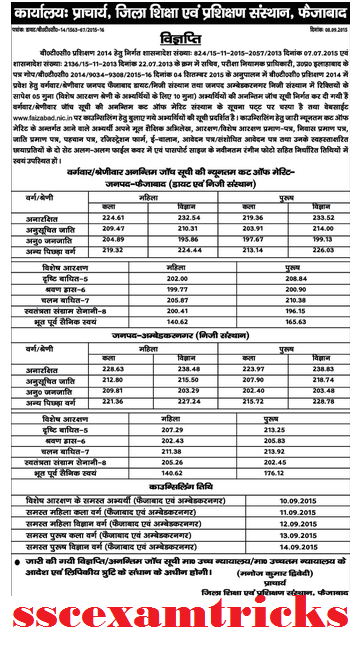 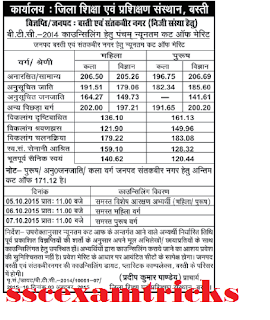 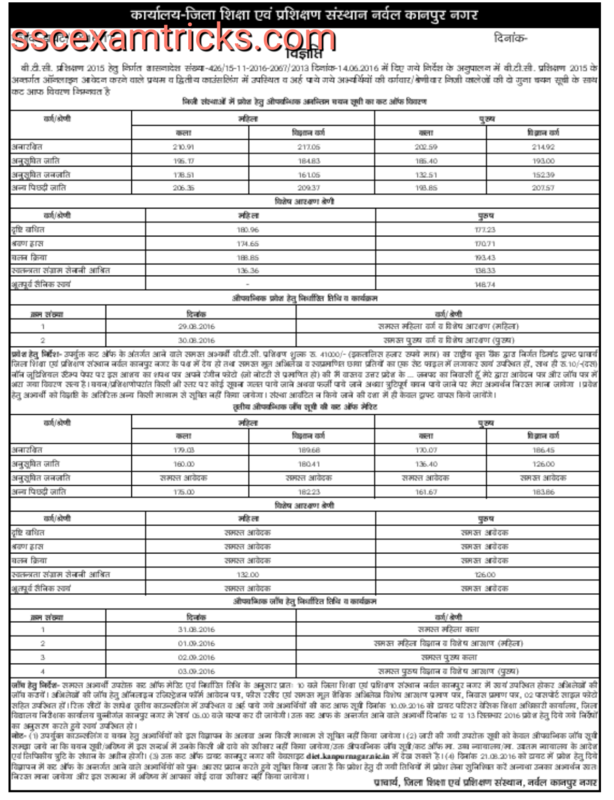 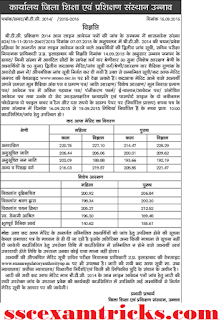 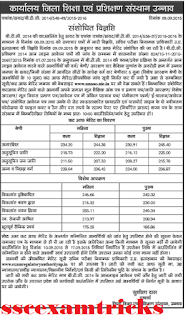 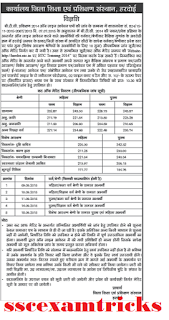 UP BTC 2014 district wise cut off (revised/ sansodhit) Latest News is given in the image provided below: Read the full detail provided in the image have category wise 1st 2nd 3rd 4th 5th cut off marks with instructions. 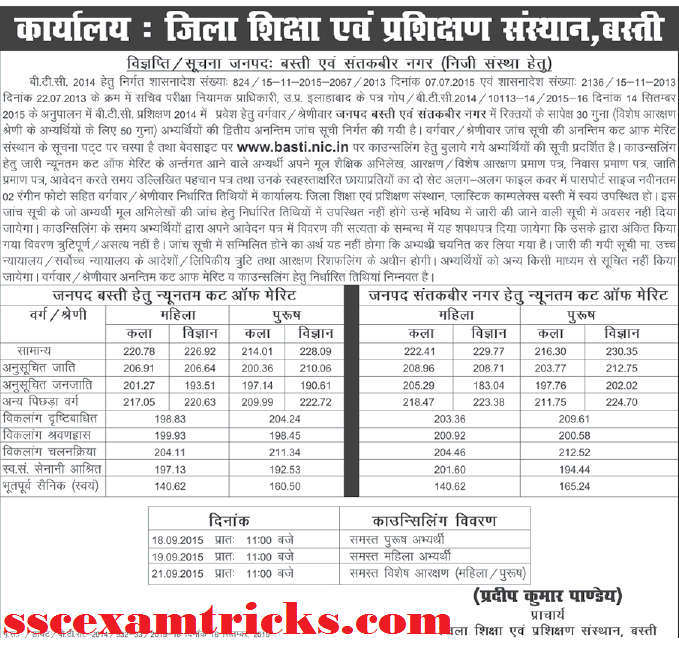 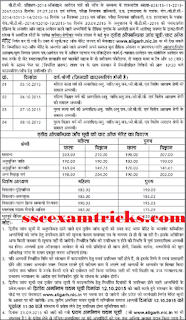 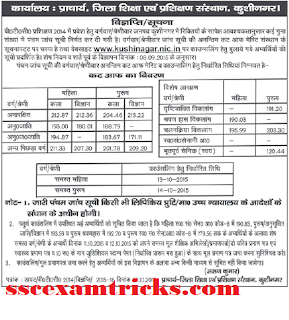 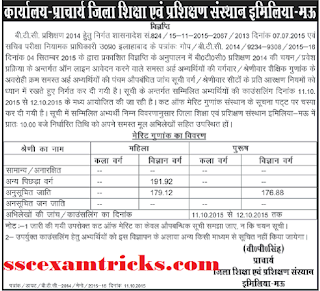 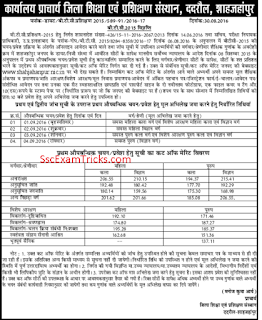 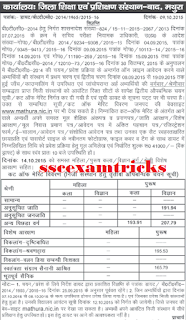 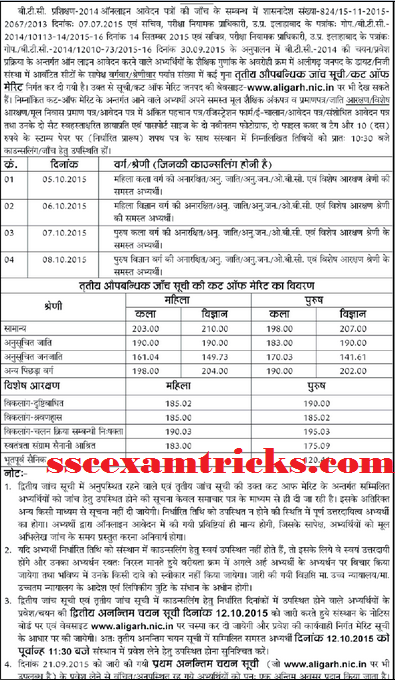 UP BTC 2013 Latest news on Counseling Date /Cut off Marks / Merit list -Uttar Pradesh Board of School Education Board (UPBSE) has released 3rd Round Merit list of Basic Training Certificate 2013 (BTC 2013) for the admission which is going to start from 17th March 2015 to 20th March on 11000 free seats in government DIET colleges in all over the state. 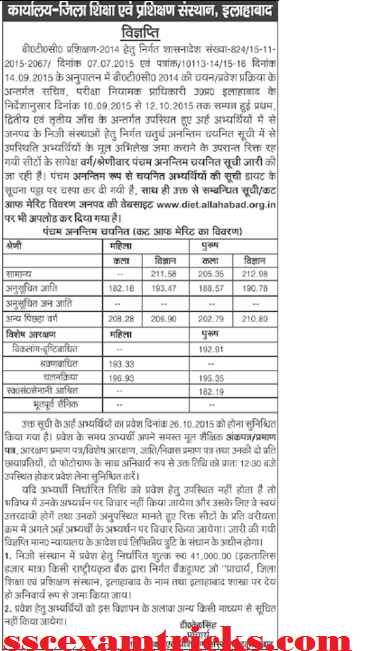 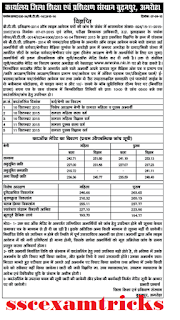 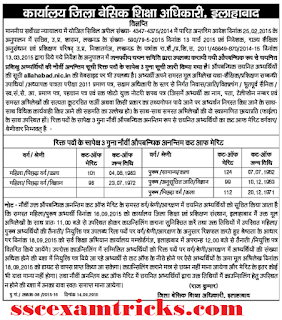 UP Edu Basic Board has online counseling letter which can be downloaded from official website from 16th March 2015 to 23rd March 2015. 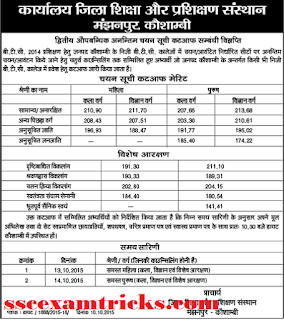 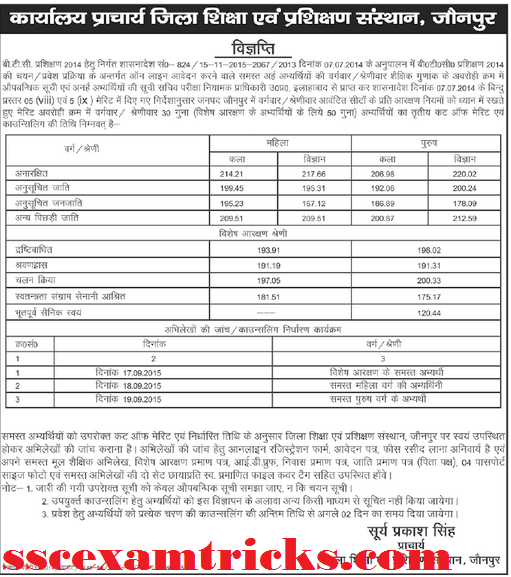 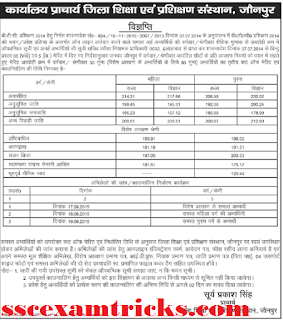 The choice on the Paid seats will be started from 23rd March 2015 (10 Districts). 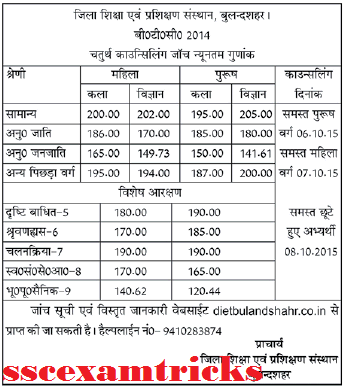 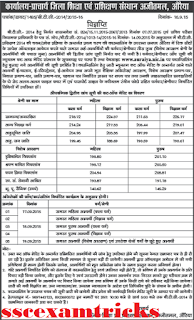 The paid Seats are available in Private DIET College is approx. 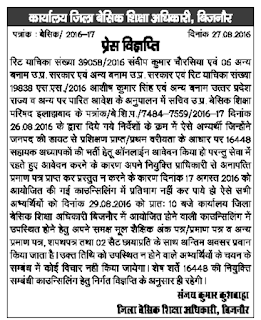 45000 seats. 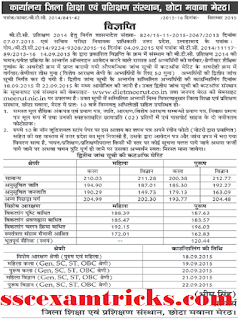 The Training of UP BTC 2013 will be started from 24th March 2015. 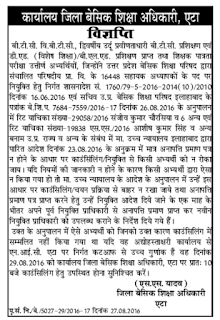 Earlier UP Edu Board had released notification publish in • Notification No. 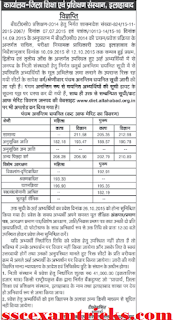 – 2136/15-11-2013 dated 22-07-2013 invited online registration for Basic Training Certificate Two Year Training Course (BTC) till 16th August 2013 on official website www.upbasiceduboard.gov.in from for the purpose of Admission on 11000 free seats and around 45000 paid seats for eligible candidates passed with 50% marks in graduate. 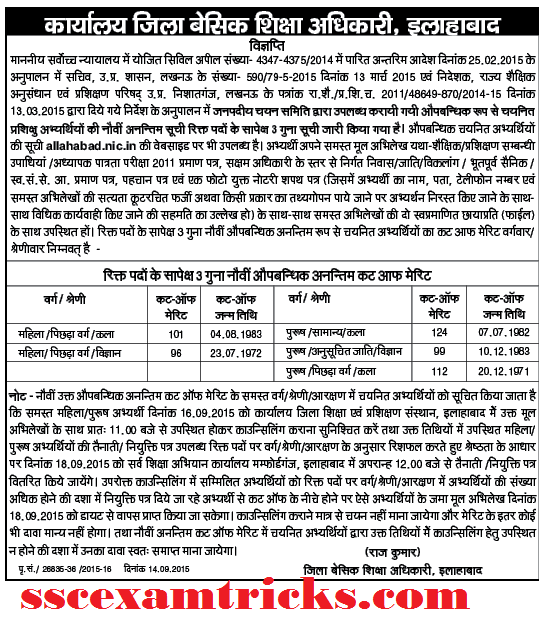 State Council of Educational Research & Training (SCERT) is responsible for organizing the BTC structure, every year for the eligible candidates of Uttar Pradesh. 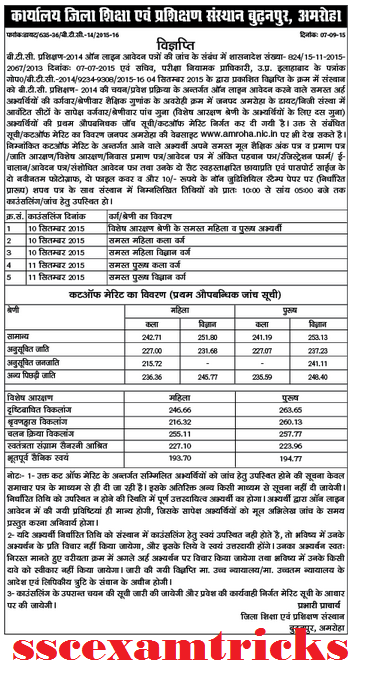 A total of Approx. 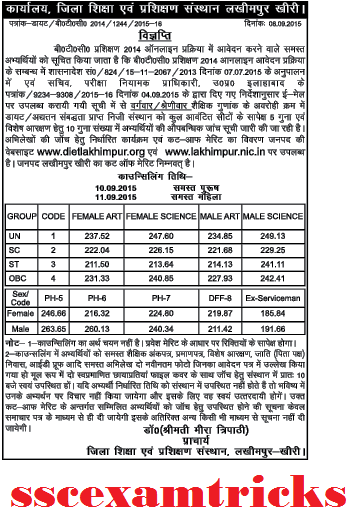 72986 candidates had applied for this course in which 36670 candidates are male & 36316 candidates are female.